DEMENTIA CARE SMALL HOUSE DESIGN CHECKLIST: SMALL HOUSE & WAYFINDING; ACCESSIBILITY; INTERIOR DESIGN; LIGHTING & NOISE; GARDENS. The Jensen Group architecture Inc. The following commentary is provided in order to present the rational and background to the Revised Multilevel Care Guidelines. Throughout the revised Guidelines a number of new terms have been introduced. CARE UNIT: A number of resident bedrooms which have their dining area, lounge, kitchen, bathing and activities area for daily living within the care unit or in close proximity to provide the environment of a large family home. CARE GROUP: Two or more care units which may share some areas for daily living, generally combined for staffing efficiencies. CARE CENTRE: The central location within the facility for staff to carry out residents health care planning and monitor building security and nurse call systems. CARE STATION: The central location within a care unit or group which will providespace for staff to carry out administrative duties in private yet remain in close observational contact with residents. A person is eligible for multilevel care benefits when there is a demonstrated need for daily care by nursing staff but the person does not immediately need the resources of an acute, rehabilitation, or psychiatric health facility. In addition, they may require the services of a physician, pharmacist, occupational and physiotherapists, social worker, dietician, and other health care professionals as available. This need is not related to specific disease classifications, but rather to a continuing physical and/or mental disability whereby the person may be unable to function in an independent manner. Although the majority of persons may reach this degree of functional dependence as a result of diseases associated with aging, a care facility may also be concerned with the provision of multilevel care to eligible young adults. The introduction of multilevel care facilities permits the integration of the various levels of chronic care in one setting, enabling residents with deteriorating health to remain in the facility of their choice. Realization of resident’s individual potential for activities of daily living is a primary goal of a multilevel care facility. It has been clearly demonstrated that putting elderly or disabled persons to bed, or locating them in an institution where they are the passive recipients of complete care, will very quickly lead to further physical and mental deterioration. Conversely, a program that provides training and practice in activities of daily living and mobility, makes available a variety of social, recreational and other types of activities providing stimulation and pleasure which can arrest or reverse such deterioration. functional ability of each person, thereby permitting a more useful and fulfilling life. The standards outlined hereinafter are intended to provide appropriate space to ensure the program will fulfil the stated objectives. 1.3.1 Multi-level care facilities must be prepared, and able to provide care for any chronic care need, although there may be more specialized facilities in some centres. 1.3.2 Providing that the Provincial policies of the last five years for home care continue, facility care will become increasingly limited to the highest levels of care for cognitively-impaired and/or extremely physically frail residents. 1.3.3 The average resident population in facility care in the next five to ten years is estimated as 10% Intermediate Care 2 (IC2), 45% Intermediate Care 3 (1C3) and 45% Extended Care (E.C) although each facility will need to develop a “residents needs assessment” in order to determine the proportion of IC2, .1C3 and EC residents. A great variety of resident needs exists within those broad intermediate care and extended care assessment levels. However summary descriptions can be provided to assist in planning and design of care facilities. Most IC2 residents in facility care will be in very frail physical condition. Many 1C2 residents will also be in the early stages of dementia while others will be cognitively alert. The majority of IC3 residents will be moderately to severely cognitively impaired with severe behaviour dysfunctions requiring high levels of care. A minority of the 1C3 residents will still be cognitively alert but will be in very frail physical condition requiring very high levels of care. Residents assessed at Extended Care are no longer independently ambulant. Extended care residents need assistance to walk a few steps (if they can still walk) and/or they need assistance to transfer between their beds and their wheelchairs, crutches or other devices for mobility. A number of residents may be admitted in the last stages of illness and thereby require palliative care. At least half of these extended care frail residents will be in some stage of mild to severe dementia. An increasing proportion will be moderately to severely cognitively impaired with behaviour dysfunctions. Resident needs within these broad categories are diverse. The census of residents within particular functional groups shifts unpredictably. 1.3.4 To respond to future care needs, a residential care unit designed today for long­term care will need to have the flexibility in the future to support the basic requirements of care for very cognitively impaired residents with behaviour dysfunctions and for extended care residents. All portions of a facility to be used by residents are to be designed for wheelchair manoeuvrability. 1.3.5 To respond to diverse care needs, a facility will need to be composed of smaller residential units that allow the grouping of residents by functional category as necessary for more appropriate care. 1.4.1 A familiar and home-like care environment encourages long-term care residents to maintain as much independence as possible and avoid excess disability. A supportive care environment is essential to keep the care workload manageable as care levels increase. 1.4.2 To provide a familiar home-like setting, resident rooms should be clustered in care units which have the dining, bathing, activity and lounge areas needed for daily living. The care unit should have the smallest number of beds that is feasible with available staffing. 1.4.3 Small residential care units can provide supportive care environments for the many types of residents in facility care. Net space requirements are listed in each section of the guidelines. Section 5.0: Resident Activity Areas. Multiply by a factor of 1.4 to obtain building gross areas from the total net areas in the remaining sections. m2 building gross per bed when the facility is freestanding and self-sufficient. m2 building gross per bed when the facility is serviced by a parent health facility. The gross square metre allowances per bed need to be increased from current levels to reflect the concept of all care beds in a facility being in flexible residential care units rather than some beds being standard Multilevel Care and some being in a special care unit. Professional monitoring of the health care needs of the resident include nursing care on a 24-hour a day basis, as well as the services of physicians, occupational and physiotherapists, a dietitian, a social services worker, and a pharmacist on an as required basis. Since a multilevel care health facility provides long term care, it should satisfy, as much as possible, the essential social needs of the resident. Residents should be encouraged to get out of bed, get dressed and move into the lounge, dining, and activity areas for part of each day. Within reasonable limits the multilevel care unit should act as an acceptable substitute for the security of the home and the friendship and support of the family. The multilevel care health facility should endeavour not only to bring contact with the outside community to the resident, but also provide access for the resident to the community. Although multilevel care activation programs will be different from the program in a rehabilitation unit, there still is a requirement to provide suitable professional direction by therapists to this part of the program, in order to assist the resident to maintain their maximum physical and mental functions as long as possible. It is essential for multilevel care facilities to have sufficient space for physical exercise, social groups, and recreational activities. To make it as easy as possible for resident’s to participate in daily activities, small activity spaces will be provided close to the resident rooms in the care units. Some amenity spaces, for example hairdressing, will be provided in the main facility for use by all residents. The residents should be capable of participating in a program developed for the activity area, although it should be recognized that the majority will require some assistance to get to this area, or have to be moved via wheelchair or other mechanized means. Intermediate Care level 2 (IC2) The IC2 classification is primarily the type of care required by persons of an age whose physical disabilities are such that their primary need is for room and board, daily professional nursing supervision, assistance with some of the activities of daily living and a planned program of social and recreational activities. Intermediate Care Level 3 (IC3) The IC3 classification is primarily used for residents who have moderate to severe cognitive impairment and/or behavioral problems that require professional supervision. Extended Care (EC) Extended care residents have additional physical disabilities which limit mobility and some residents may also have severe behaviour problems. The average resident population in facility care over the next five to ten years in B.C. is projected to be 10% 1C2, 45% 1C3 and 45% EC. A diversity of resident care needs is contained within those broad assessment levels. While the primary users of facility care are the very elderly (85+), residents can include much younger residents with chronic care needs. The design guidelines which follow describe a basic care unit design with the flexibility to serve very cognitively impaired residents with severe behaviour dysfunctions or for very frail extended-care residents, a large proportion of whom may be cognitively impaired. The care needs of these two groups cover a wide range of design requirements. A care unit with the flexibility to meet the basic requirements of these resident groups can also meet many of the basic requirements of care for other chronic care needs. An introduction to the care needs of these two broad categories of residents is provided below to place the specific design guidelines in context. . In the initial design of any facility there will be specific uses designated for each care unit. These specific uses for particular resident groups would result in more design features being added in the particular project to the basic care unit design described in the Design Guidelines. The emphasis in the guidelines is on a basic and flexible care unit design. A number of residents in multilevel care facilities will have severe mental health and behaviour management problems. Some residents with such problems exhibit behaviours which place them, and other residents, at risk. These residents present special care requirements and are a challenge to the providers of health care. The information which follows will provide a framework for design consultants and facility operators to plan and design flexible care units which can provide a suitable care environment for residents who have dysfunctional behaviours. These guidelines recognize that environmental design is one of the factors that influences extreme behaviour. Other factors for managing dysfunctional behaviour include proper medical evaluation, multi-disciplinary care planning with trained staff and judicious use of medication. Disorders affecting the elderly are primarily disorders that affect cognitive ability (organic brain syndromes) and mood (e.g. depression). Organic mental syndromes can be subdivided into acute (delirium) and chronic (dementia). Dementia is by far the most prevalent condition especially among the institutionalized elderly. It is usually a degenerative brain condition, however dementia associated with specific medical condition, drug or alcoholic toxicity, is reversible. The two major causes of dementia are Alzheimer’s Disease which is estimated to account for 50 to 60 percent of the cases, and multiple infarcts dementia (strokes) which account for 20 percent of the cases. The resident population afflicted with mental health disorders in long term care facilities in British Columbia varies from 27 percent3 to an estimate of 40 percent by McKewan based on a Canadian survey of institutionalized elderly and a U.S. National Nursing Home Study, 1989. The prevalence of mental health disorders increases with age. The B.C. Association of Community Care, Guidelines for Special Care Units, 1988, includes statistics that illustrate an increasing percentage of the population in British Columbia will be over 65 and a significant number will be over the age of 85. 3 B.C. Association of Community Care; Special Care Report, 1987. A small section of residents with severe mental health disorders suffer behaviour management problems. Assessment, professional care plans and supervision including special programs and an environment to help reduce aggressive and dysfunctional reactions are provided to modify resident behaviours. Stressors that may worsen behaviour are fatigue, change of routine, excessive demands, overwhelming stimuli and the physical impact of acute pain or illness. Once the stressors are removed or controlled, dysfunctional behaviour declines. It is the objective of special care to return such residents to their regular environment when their dysfunctional behaviour reaches manageable levels. A physical arrangement which enables residents to function at the maximum level of their ability. A properly designed environment can help residents with dysfunctional behaviours function more effectively and will contribute to their quality of life.6 Prosthetic elements provide added information about the environment. It is difficult for many residents to find their way in the building and identify their surroundings. Architectural detail that may cue memory such as special definition of doorways and rooms, changes in colours and of patterns, should be used. Special attention to these elements can maintain or increase functional capacity. Safe surroundings for the resident should be an integral part of the design along with protective arrangements to guard against personal injury. Creation of a residential, home-like and non-institutional setting is desired. The residential quality enhances familiarity and resident’s ability to understand and cope with the new surroundings. The transition from the home where the resident lived prior to the onset of illness is thus less traumatic. The care unit concept provides the opportunity within the care facility to house different resident groups separately to provide more appropriate care. Physically separate units dedicated to meeting special needs are appropriate for residents with severe mental health and behaviour management problems.7 People with behavioral problems require special programs and environments to function effectively. Mixing of impaired and non-impaired residents places stress on both parties. The impaired have difficulty functioning in the non-specialized environment and the unimpaired find it difficult to cope with the behaviour of the impaired residents. For staff, difficulties lie in trying to minister to the needs of people with mixed levels of ability, and the time and energy required to sort out tensions between the residents could be more positively directed toward creative interaction with them. Integration of the residents with behavioral problems into the general programs and activities in the facility may be appropriate on a limited basis. The unit should be connected to the long term care facility to facilitate this interaction. 7 Health and Welfare Canada, Draft Design Guidelines for the Cognitively Impaired Elderly, 1989. Single bedrooms are strongly recommended for each resident. Single rooms allow maximum flexibility in placement requirements, allow residents privacy with visitors, and help prevent misappropriation of other’s belongings. Sleep patterns vary between individuals who suffer from dementia, and shared rooms cause disturbances. Walking, pacing, and gait impairment are three aspects of dementia that are common among people with cognitive impairment. The physical design of the building and the grounds can minimize the associated difficulties..
Walking/pacing can occur at night as well as during the day. Consideration should be given to avoid disturbing the other residents. The impetus for the walking is not known. People with dementia may have difficulty in walking which when coupled with difficulties in depth perception can result in an increased likelihood of falls. Resident safety is the major concern with respect to walking. Safe accommodations consistent with the dignity of residents must be provided in a manner which will promote independence and optimum functioning. A secure unit will provide loops for 1C3 residents to walk at will in safe and familiar surroundings, both indoors and outdoors. An interesting and stimulating space can be provided to allow walking/pacing to occur. The preferred approach is a loop in which the resident does not come to a dead end. Each care unit should have separate walking and activity spaces if possible. 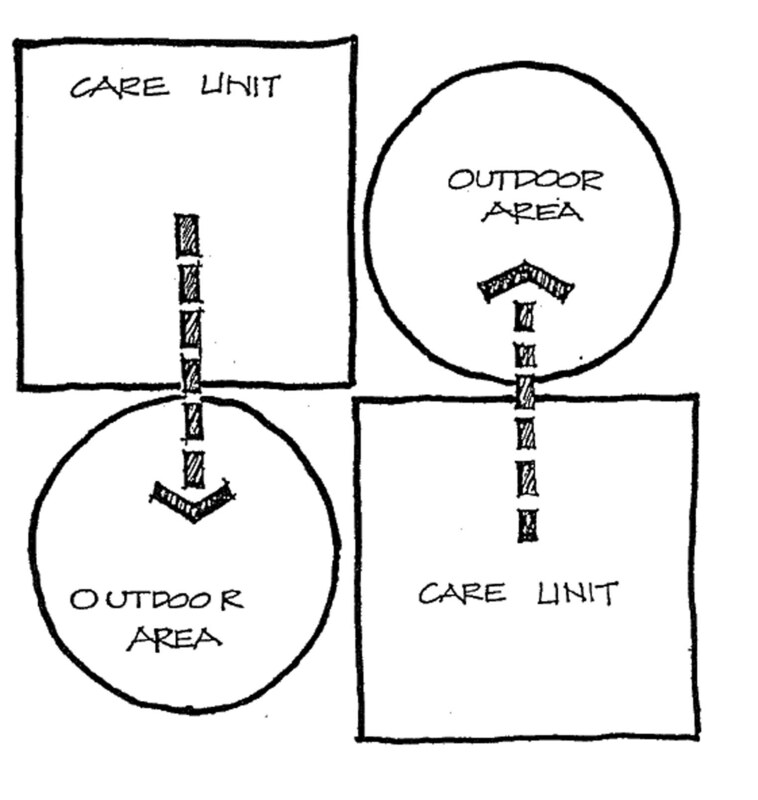 On restricted sites, two adjacent care units may need to share an outdoor area (see 3.3 Design Principles). Inside the Unit there should be interesting spaces along the walking loop: lounge, nooks and appealing wall decorations. Outside, the walking loop can be integrated with the landscaping and seating areas. Boundaries, defined by plants or configuration of the building must be unobtrusive and have the potential for being effective as fences. Fences hidden by plants should also be considered. Security measures such as door buzzers, video monitoring cameras, if necessary, etc. should be selected to provide for optimal security in the least intrusive manner. The observation capability of the staff should be maximized in the design of the unit, particularly at access points to the unit and to the outside. Control of exit doors is essential. These may be electrically locked doors provided they are tied into the fire alarm system for automatic release opening. Code requirements should be confirmed. Residents with cognitive impairment should be provided with associations from the past including artifacts, activities, to facilitate stimulation and social interaction thus enhancing the quality of life. The presence of things from the past also helps to create a more home-like environment and allows for personalization of individual spaces.. Artifacts in resident rooms can contribute to recognition and become landmarks in way finding. Enclosed outdoor space shall be readily visible from communal living areas. Large open spaces can be disorienting for cognitively impaired persons.9 The outdoors should not only allow freedom of mobility but also assist residents to follow clear paths to desired destinations. Safe surroundings include plants which are non­toxic if ingested by residents. The same information can be presented via several modalities (redundant cuing), by means of colour, form, and texture. For example, light switches can be made conspicuous in both colour and form.10 It is important that cuing be consistent, i.e., the colour red is associated with “hot”. Consistent repetition can introduce an element of predictability into an environment. It is important to accentuate the cue and to dampen or moderate background stimulation. Objects in the environment can be designed to compensate for decreased motor-skills. Lever action handles instead of door knobs and pressure plate light controls instead of switches are two examples. 8 University of Wisconsin, “Environments for People with Dementia”. 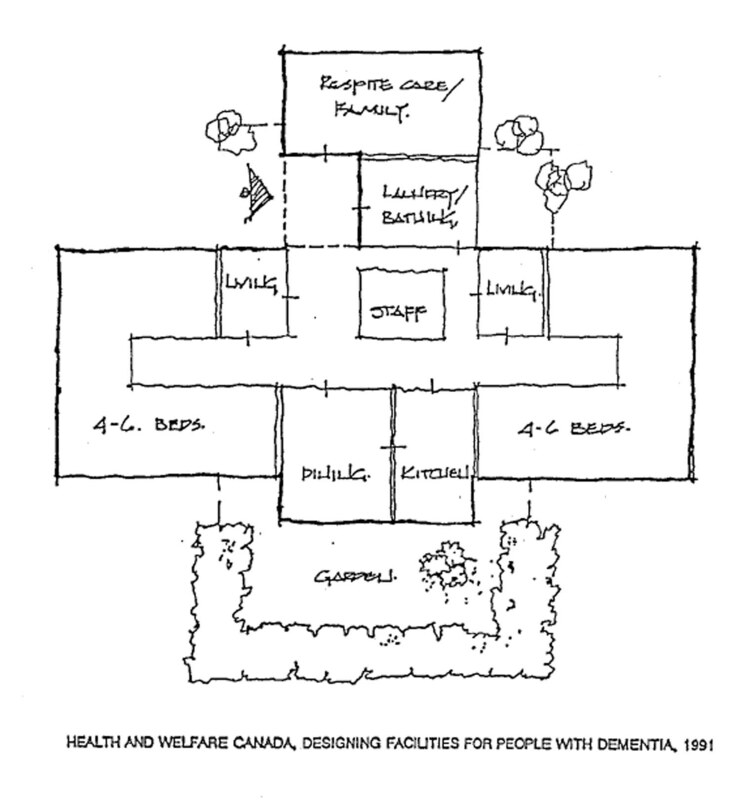 9 Health and , Welfare Canada, Draft Design Guidelines for Facilities for the CognitivelyImpaired Elderly, 1989. 11 ‘Services to Elderly with Mental Health Problems”. Multi-level care facilities must be prepared to provide care for any chronic care need, although there may be more specialized facilities in some centres. Facility care will become increasingly limited to the highest levels of care for cognitively-impaired and extremely physically frail residents. Resident needs within these broad categories are diverse. Some resident groups need to be housed separately for more appropriate care. The census of residents within particular functional groups shifts unpredictably. To respond to future care needs, a residential care unit designed today for long-term care will need to have the flexibility in the future to support the basic requirements of care for very cognitively impaired residents with behaviour dysfunctions and for extended care residents. A large proportion of these extended-care residents may also be moderately to severely cognitively impaired. The space standards of this guideline are based on a 75-110 bed stand-alone Multilevel Care (MLC Facility) serving a care population of 10% 1C2, 45% 1C3 and 45% EC projected for the next five to ten years where all residents are housed in residential care units. Design teams planning stand-alone facilities of lesser or greater number of beds will be reduced or increased as required. Design teams planning MLC facilities as additions or adjacent facilities to existing buildings will need to adapt these concepts appropriately. 3.3.2.1 To provide a more familiar home-like setting, resident rooms should be clustered in care units which have the dining, bathing, activity and lounge areas needed for daily living. A home-like environment encourages residents to keep participating in the daily activities of normal life as long as possible while an institutional hospital-like atmosphere encourages them to depend on others for their care. A familiar home-like environment makes it more possible for cognitively-impaired residents depending on long-term memory to continue participating in the activities of normal life. When the resident common spaces for these activities are close at hand, residents can reach those spaces independently for a longer time. When long distances have to be covered to reach these spaces, residents end up in wheelchairs earlier. Care units need to be. as self-sufficient as possible for daily resident activities. Small relatively self-sufficient care units can be used to house different client groups where needed for appropriate care. The more self-sufficient each care unit is for daily living, the less need there is to mix groups of residents who may not interact successfully. 3.3.2.2 The care unit should provide opportunities for privacy and for socialization on a manageable scale. Commentary: To encourage residents to participate in the daily activities within the care unit that can stimulate them to maintain and even improve their mental and physical condition, there must be opportunities for socialization on a manageable scale and opportunities for privacy. Opportunities for privacy centre around a resident being able to retreat to a private room (see section 3.5) and having ready access to a ensuite washroom (see section 3.6). The manageable scale for socialization depends on the degree of cognitive impairment and physical frailty a resident is experiencing. The small groups recommended for dementia care will also be more manageable for physically frail residents. The care unit should have the smallest number of beds that is feasible with available staffing. work session reported that the 25 bed special care units are too large for clustering small groups of residents with different behaviourial problems who need to be separated from each other. One example was the need to protect the ambulant confused resident from the dangerous psycho-geriatric resident, yet both of these residents need to live in secure units. The MLCDG Staffing Scenario Sub-Committee developed the preliminary staffing scenarios described below to analyze the smallest feasible number of beds for a care unit based on the current MLC staffing formulae and an average care population of 10% IC2, 45% IC3 and 45% EC. This analysis begins with a discussion of the resident population in care facilities and why care in small groups is considered appropriate. Staffing scenarios for three care unit sizes (12, 18 and 24 beds) are examined in the following section which concludes that 18 beds is the smallest feasible number of beds in a care unit for the average facility care population projected in the next 5 to 10 years. Smaller units may be possible with special architectural solutions which facilitates night time coverage by combining care units. A separate commentary follows on design techniques that can be used to subdivide a care unit into smaller clusters of 4 to 8 beds as recommended for dementia care. These smaller dusters must also function as part of the care unit and/or care group (2 care units) for effective staffing and resident safety, particularly at night. The MLCDG Review Committee has estimated that the average population in facility care over the next five to ten years will be 10% IC2, 45% 1C3 and 45% EC. Ministry representatives on the Committee agree that this provides a reasonable projection of average facility care populations. While the 10% 1C2 component may have disappeared by the year 2004, the 50/50 split of IC3 and EC residents is likely to hold true as long as the current system of home care services continues. In B.C. the very elderly population (85+) who are the primary users of facility care is expected to increase by 64% between 1994 and 2004. The population over 75 is projected to grow by 44% in the same 10 years. Higher demands on the health care system will continue increasing health care costs at a time when there will be less working taxpayers in a position to support those costs. The pressure on the Government to control the cost of health care can only increase. To keep costs feasible, the Government will be likely to continue, and even expand, the current system of home care. While home care services may keep many very frail elderly in their homes until they reach the extended care stage, moderate to severe cognitive impairment from Alzheimer’s and other dementia-causing diseases will continue to bring frail residents into the IC3 facility care population. Residents with severe behaviour dysfunctions from other causes will also be included in this 1C3 population, along with a smaller number of other extremely frail residents who are cognitively intact and still ambulant. The high levels of care required for moderate to severe dementia and/or severe behaviour dysfunctions can be given most effectively in a supportive physical environment that clusters residents in small groups. For care of moderate to severe dementia, Health & Welfare Canada states as follows: ‘experience suggests that 4 to 8 is the ideal group size, though 8 to 12 may be more realistic for economic considerations. Several sources suggest that a unit should contain a maximum of 10 to 20 residents. One can usefully think of a unit as made up of a number of smaller groups or clusters; each cluster might consist of four to eight residents with their rooms clustered around a living room.” Fig.3-1 shows a diagram of the 8-12 bed care setting that this Health & Welfare Canada document describes. Some extremely frail (or disabled) but cognitively alert residents assessed IC2 or IC3 requiring high levels of care will also be part of the population in facility care. Extremely frail elderly residents with the hearing and vision impairments of aging can benefit from the more home-like environment of small care units. The care unit setting will make it easier for them to make the most use of their remaining faculties and stay as independent as possible. Severely disabled residents who are younger than the average population in care facilities usually want housing in a ‘group home” yet many of these residents require high levels of care making their placement very difficult. Small care units in a larger care facility may be a way that society can afford to provide small “group homes” for the severely-disabled and still provide the professional care these residents need. Dramatic results have been demonstrated by providing situations and activities which interest and stimulate [residents] so that they strive to maintain independence. Table 2 examines the minimum direct care staff coverage considered feasible by the Staffing Scenario Sub-Committee for the same average care population and the same three sizes of care units. As in the first table, each care unit was assumed to be part of a larger care facility of at least 75 beds. 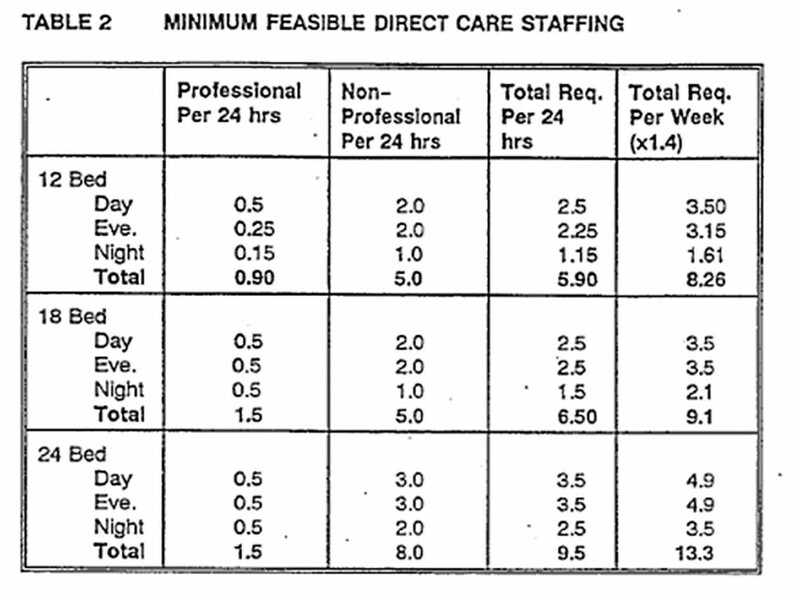 It is recognized that activities staff are part of the FTE allowance for direct care under the MLC staffing formulae. However Table 2 shows that for an 18 bed care unit, the activities positions would have to come instead out of the total staffing allowed the facility under the cumulative allowances in the MLC staffing formulae. Care providers involved in design of new stand-alone Multilevel Care Facilities of 75 beds have reported that it is feasible to reallocate part of the budget that would normally cover other support staff positions to resolve these direct care needs. The shortage of maintenance and other support staff that results is considered manageable. The average population in facility care for the next 5 to 10 years is projected tote: 10% IC2, 45% IC3 and 45% EC. 1.4 Full Time Equivalent (FTE) allowance will cover one shift 7 days/week (no relief). 15 Hospital Programs, B.C. Ministry of Health, Guide for Operation of Extended Care Programs, 1984. (The word “resident” has been substituted for “patient” and “care facility” for “hospital”). The conclusion was that care units for a population of 10% IC2, 45% 1C3 and 45% EC need to accommodate 18 beds in order to provide reasonable coverage for night staffing and for the day workload, particularly the need for eating assistance at meals. Note that 18 beds cannot be a stand-alone care unit but must be part of a larger facility for adequate coverage. The decentralization implied by the care unit concept means that the layout of every care facility must be very carefully designed to ensure adequate day and night professional supervision of direct care staff. At night in most care facilities, one RN will be responsible for supervision of the non-professional staff caring for 50 – 75 residents. At night in some care facilities, one care aide might be responsible for 20 – 25 beds. With the higher care levels projected for the average care population, one care aide would more likely have responsibility at night for 18 beds. With severe behaviour dysfunctions, that care aide must have immediate assistance from another care aide in an adjacent care unit or from the RN. Two care units with linked circulation to allow 36 beds to function as a care group for more effective staff coverage is recommended as a design approach (see Section 3.4 Commentary). The same efficient circulation between adjacent care units and throughout the entire facility is required for effective care during the day particularly during meals and other heavier care periods. If a care provider identifies special resident groups in the care population projected for a particular facility which have care needs significantly higher than the projected average care population for B.C. and is successful in negotiating higher staffing with the Ministry, then the feasibility of smaller care units for those resident groups can be considered. However, the flexibility of these care units to respond to different care needs (with average staffing) in the future must still be a concern. In the Phase 1 interviews, many care providers reported that the direct care staffing levels allowed by the current formulae were very tight, given the increasing care levels now being experienced. However, the overall cost of health care is projected to continue to rise over the next ten years particularly with the projected impact the 64 percent increase in the very elderly population (85+) who are the primary users of facility care. Therefore the critical need to control health care costs can only continue. Care units designed today must be feasible for staffing under the current MLC formulae since funding levels for staffing are unlikely to be able to be increased in the future. Staffing represents 80 to 85 percent of operating costs of a care facility. Operating costs equal the capital cost of construction of the average care facility in 2 to 3 years. Therefore, increasing the cost of construction to some degree to create more home-like care unit environments is worth considering as a reasonable way to keep the care workload more manageable. The care unit configuration should develop smaller clusters of resident rooms within the care unit that encourage the formation of small social groups. Room clusters of 6 beds and room clusters of 9 beds might be created in an 18 bed care unit. We note that care staff sometimes consider uneven numbers of residents less effective for social groups and care planning. Dr. Tooth believes 8 residents form the most effective social group for the kinds of residents with behaviour dysfunctions he serves through the ADARDS Centre in Tasmania. The ADARDS Centre was built to house residents with the most difficult behaviour problems so that dementia wards in the local mental hospitals could be closed. It is important to realize that the ADARDS Centre with its 8-bed “houses’ is not a long­term care facility. The ADARDS Centre provides short-term intervention to allow residents to be stabilized for transfer to long-term care facilities. The average stay for ADARDS Centre residents who are eventually transferred to another care setting is 9 months. The average stay for other residents (those who die in the ADARDS Centre) is 18 months. Fig. 3-2 shows the layout of the ADARDS Centre with four houses of 8 beds joined at the centre to form a 32-bed care facility. The night nursing station is located in the centre where the nurse can see down the corridors into each care unit. Each “house’ has its own living room, dining area, kitchen and laundry. The main meal at noon is cooked in the kitchen of each 8-bed home by a cook who also prepares the evening meal for the staff to reheat. Each house in the ADARDS Centre has an efficient internal walking loop for wet weather where residents can loop around the living room and go up and down the bedroom corridor or continue onto the verandah breezeway and back into the house. In good weather the walking loop is extended through the secure outdoor area. The ADARDS Centre has a care staff to resident ratio of 1.4 in the busy times of day (morning, meals and sundown), 1:8 in the quieter evening period, and 1:16 at night.17 This does not include for the total staff of the facility. Although the B.C. system is currently significantly different, the ADARDS Centre is a useful example that should be carefully studied because it raises so many of the layout issues that must be solved in innovative care unit design. It also shows in its simplest form the concept that small home-like care units for daytime living must be combined into larger care groups for staffing at night. The following discussion illustrates some of the care unit variations that naturally create smaller social groups within units larger than the 8-bed care unit used by Dr. Tooth. The 18-Bed care unit is considered the most feasible care unit size for staffing under the current MLC guidelines. Fig.3-3 shows one way of creating three clusters of 6 resident rooms in a 18-bed care unit linked together to form a care group (2 care units) of 36 beds. Fig.3-4 shows another variation of this type of care unit that creates three smaller clusters of resident bedrooms around a central area containing common support functions. 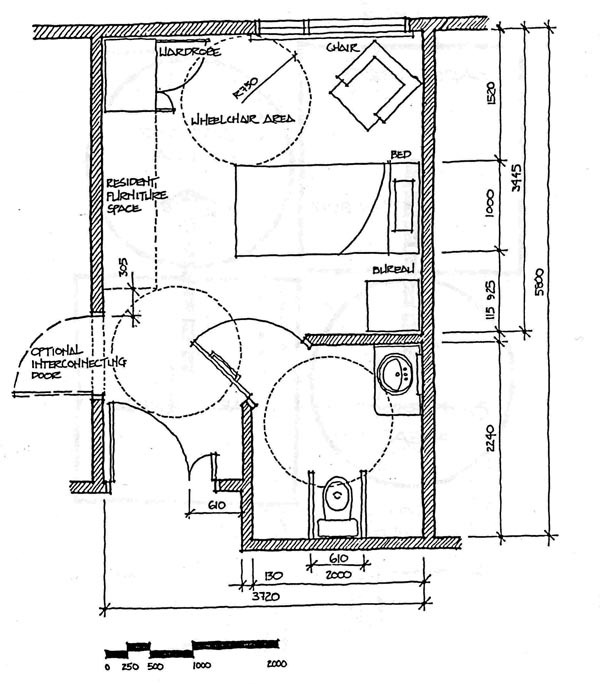 Fig.3- 4 is based on the layout of Jack Ledger House, a 25-bed care facility for psychiatric care of disturbed adolescents and teenagers located on the grounds of the Queen Alexandra Centre for Childrens’ Health in Victoria. Jack Ledger House provides a useful example of a care unit layout that meets some of the challenges of housing resident groups with diverse psychiatric and behaviouial dysfunctions. The general layout (and the separate care station, activities area and resident kitchen) make it possible to cluster residents by similar ages and/or dysfunctions and protect the other residents from the behaviour of the most severely disturbed residents. 17 Tooth, Dr.J.S.H., Dementia Care, An Australian Perspective, A One-Day Workshop for Professional Caregivers, Oak Bay Kiwanis Health Care Society, Victoria, September 1994. The particular layout with separate common areas for every resident group provides almost total segregation of residents and, at the same time, allows the facility to be operated by minimum staff at night (1 RN, 3 aides). The layout has been flexible enough that the 9-bed room cluster has the capability to operate as two sub-clusters, a special care unit and a response unit dealing with very difficult residents when they are first admitted from the community. The main features of the dementia care unit at the Westside Care Facility near Kelowna is the layout which is based on a figure 8 walking loop through the common area of a 27-bed care unit. The figure 8 circulation layout gives the capability of dividing the care unit by closing the doors at the centre to separate the residents who occupy the rooms clustered around the outside of each lobe of the common area. The care provider reports that the doors are closed primarily at mealtimes to help care staff collect easily-distracted residents who wander away from their meals when they forget they are eating. The emphasis on smaller “homes* within the larger facility has increased in B.C. since Westside was designed three years ago. The Westside dementia care unit has a layout that naturally creates two smaller room clusters that can be emphasized with wayfinding colour schemes. The Westside Care Facility is an adaptation of the Corrine Dolan Alzheimer’s Centre, Heather Hill, Chardon, Ohio. The Corrine Dolan Centre was a pilot project designed to study the effects of a more residential care setting on dementia care. The positive results obtained have resulted in variations of the Corrine Dolan Centre concept being adapted for several new bare facilities in B.C.. The Westside Care Facility and the Corrine Dolan Centre have in common the figure 8 layout through the common areas of the care unit. However, we can also see that the Westside Care Facility has relocated several functions. For example, the bathing area which is in a prominent location in the Corrine Dolan Centre, has been relocated to another central but more private location in the Westside Care Facility. 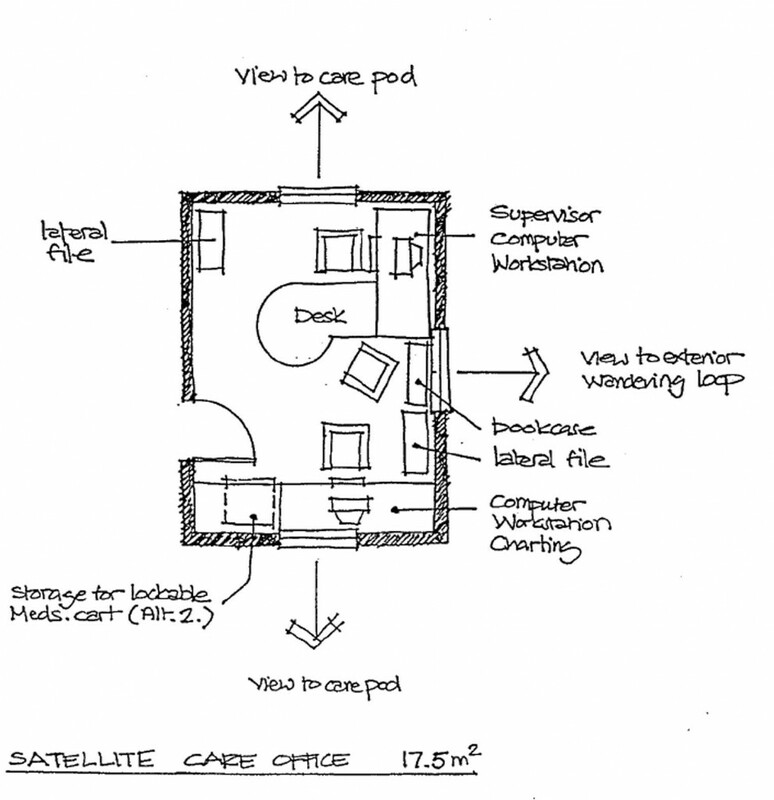 The Corrine Dolan Centre provides useful features to be considered in care facility design. However, it should be noted carefully that the Corrine Dolan Centre is a pilot project designed for research purposes rather than a conventional care facility. The admission and discharge criteria should also be noted. The Corrine Dolan Centre has chosen to deal with only the moderate stages of dementia. Residents with severe Alzheimer’s are transferred to other facilities. Fig.3-5 shows the Delta View Habilitation Centre near Tsawwassen, B.C. as an example of a completely different adaptation of the Corrine Dolan concept to house dementia residents with very difficult behaviour problems who are transferred from other dementia care facilities. The 80-bed Delta View facility consists of two 40-bed care units on either side of a central administration and support building. Each 40-bed unit consists of two room clusters of 20 beds divided by a common lounge and dining area with care station. 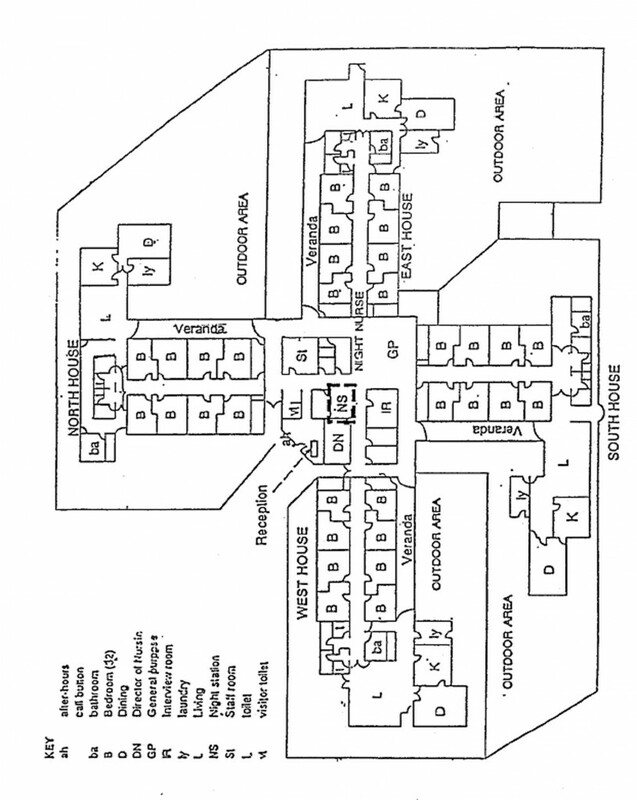 Fig.3-5 shows that each of the -40-bed care units is divided by a central area for dining, lounge and activities with a 20-bed cluster of resident room on either end of the common areas. Note the differences between the bedroom corridors at Delta View and those at the Westside Care Facility and the Corrine Dolan Centre. In the case of the Westside Care Facility and the Corrine Dolan Centre, the resident rooms are clustered around the lobes of the central common area and walking loop. In the case of Delta View, a different approach has been used. The 20-beds of resident rooms in turn form sub-clusters of 10 rooms lining the outside of the bedroom cluster. The central space opposite the bedrooms is taken up by common areas but they are almost all closed wall spaces like laundry and bathing and other functions. Only the small and very angular lounge at the point of the room cluster is an open space. The Delta View layout was chosen deliberately to produce very quiet corridors opposite the resident rooms. These quiet bedroom corridors have proven successful with the extremely disturbed residents which the Delta View Habilitation Centre specializes. It is important to note that Delta View serves residents who have been considered too difficult to handle in other dementia care facilities elsewhere in the Province. Note that the dining area in the centre of the care unit tends to naturally form four smaller dining groups due to the island of nursing station and other common functions in the centre of this space. The care provider noted that this is a very successful feature of the design. Both care units were funded for dementia care however, one 40-bed unit is now being operated for extended care. The owner/operator reports that the extended care residents seem to enjoy their rooms and that the care staff feel the unit operates relatively well for extended care except for the lack of care equipment storage. (Lifts and other large items are now being -stored in the least used part of the bedroom area walking loop. This practical test of the flexibility of a dementia care unit for extended care could provide useful information for evaluating the flexible care unit concept the Ministry is considering under these guidelines. The Delta View care unit also provides an example of linked walking loops. The central walking loop which naturally forms in the dining area around the central core of the nursing station is linked to two much larger walking loops which go around the resident corridors at each end of the 40-bed unit. Note also that there is the potential to take a very upset resident and allow him or her to wander within the bedroom corridor behind closed doors to the central common area. The upset resident could wander and shout without disrupting other functions that were going on in the central lounge and dining area. The ability to allow cognitively impaired and behaviour dysfunctional residents to “work off steam” by shouting loudly and acting out is a necessary function in dementia care units. Delta View shows one way that these kind of behaviours can be accommodated with less infringement on the rights of other residents to enjoy the open common areas. Fig.3-6 shows another care unit scheme with resident rooms on the outside clustered around central common areas. This care unit is an addition to the Dr. F.W. Green Memorial Home for the gentle care of psycho-geriatric residents. This layout of a 10-bed care unit was designed with the care station at one end of the initial care unit so that the design could be expanded in the future to add a second care unit of 10 beds at the opposite end served by the same care station. 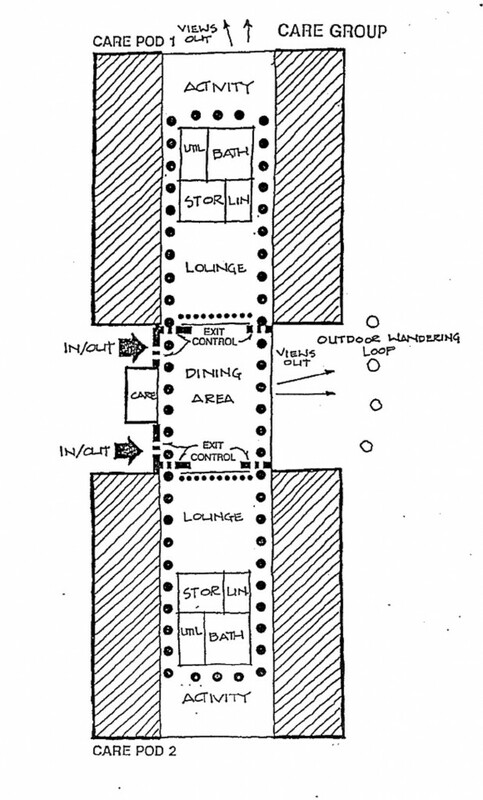 Fig.3-6 is included here to show one way of dealing with a central common space to provide manageable scale in the central common areas. Everything in the centre of the care unit is a common function. However half of the functions in the centre are open spaces like dining and the other half are closed-wall functions like bathing, quiet room, team conference and soiled utility. F.W. Green is only one possible variation on the care unit with central common areas. However careful selection of both open-space and, closed-wall functions for the common areas are one way to provide a smaller “family” scale for the central common spaces and help to control noise. The care staff at Westside reported some concerns about control of noise and manageable scale in the central common areas. The F.W. Green scheme shown in Fig.3-6 minimizes views from the care unit to outdoor spaces as requested by the care provider to reduce stimuli for the residents. There is ample natural light through clerestory window overhead but outside windows are restricted to the resident rooms only. The Review Committee has emphasized that it is essential for flexible care unit designs intended for use by a variety of future residents to have outside views from the central common areas as well as internal views inside the care unit. You will notice that in the Corrine Dolan Centre and Delta View (Fig.3.-5) the only common areas with outside views are in the centre of the care unit. The outside views are from the resident rooms. The Westside Care Facility is a more inward-looking scheme with limited outside views in the centre of the care unit looking onto the outside walking loop. 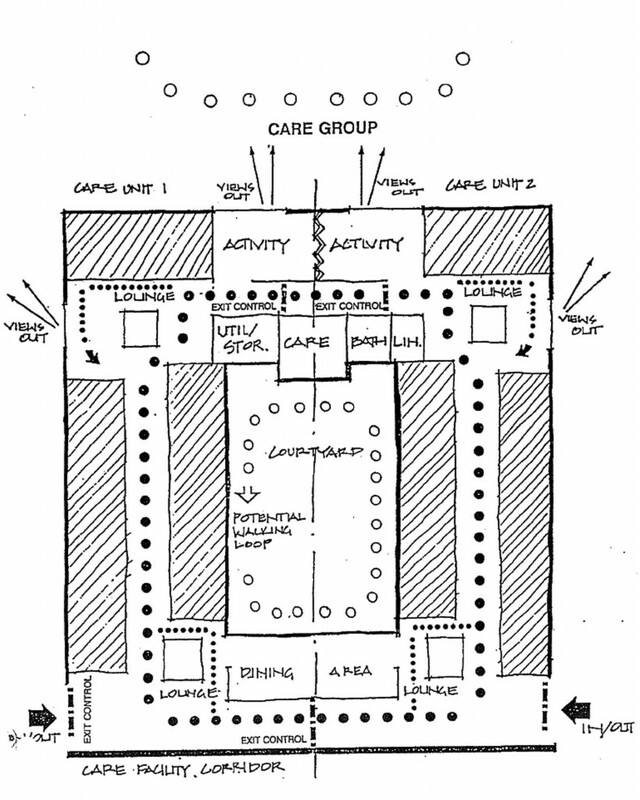 It is important to realize that each of the care unit layouts with central open spaces in Fig,3-4 through Fig.3-6 were designed only for residents suffering from dementia or psychiatric problems, whereas the flexible care unit layout which the ML C Guidelines describe must be suitable for care of both cognitively alert and cognitively impaired residents in a multilevel care facility who are also in varying physical conditions. A variety of views of indoor spaces within the care unit and within the care facility as well as outdoor passive and active views provide an essential asset to the psychological wellbeing of the residents who because of mental or physical health tend to be inside the care facility for long periods of time. Care providers designing facilities for specific groups may sometimes want to limit outside views to reduce stimuli to provide more appropriate care. The approach preferred by the Review Committee is flexibility, The care unit should have ample outside views from the common areas to make the design flexible for all residents, Curtains or screens can be used to close off views when this is needed temporarily by individual residents in some care units. The great value of layouts shown in Figs.3-4 to 3-6 is that they demonstrate clearly great variations in care unit layouts. We believe that these variations in care unit layouts are desirable because of the unique needs of particular resident groups and the special conditions of particular sites. The need to provide ample outside views for residents from the care unit common areas is a design challenge on many sites since all resident rooms also require windows. Care units which feature courtyard schemes with some views from common areas towards the courtyard and other views from common areas towards to outside grounds of the care facility are one of the approaches to handling this concern. The Multilevel Review Committee have emphasized that in a courtyard scheme it is essential to have outside views to the landscaped grounds of the care facility and that views from common areas should not be limited to views of the courtyard only. Efficiencyof circulation for the care staff must also be considered. 18 Health & Welfare Canada, Design Facilities for People with Dementia, 1991. Fig.3-7 shows a 12-bed care unit that was one of the preliminary layouts considered for a new Multilevel Care Facility. Each cluster of 6 bedrooms is served by its own lounge, one at the entry to the care unit (connecting to the rest of the care facility) and one on the end of the care unit facing out to the grounds. Fig 3.7 also shows how the 12-bed care unit can be linked to an adjacent care unit to form a care group of 24 beds. The dining area which serves both the care units has views to the courtyard. This kind of view may be less distracting for dementia care residents while they are eating. The small lounge near the entry of each care unit can have “front porch’ views through windows onto the ‘main street” of the care facility and onto the courtyard. The activity area and second lounge at the other end of each care unit look out to the landscaped grounds of the care facility. The separate lounges are one ingredient needed to create effective small social groups. The second is the configuration of the care unit which forms room clusters, In this scheme, one cluster of rooms is located in the area of double-loaded corridor closest to the lounge by the care unit entry. The second cluster is located at the outside end of the care unit near the second lounge. To emphasize the two room clusters, each cluster of rooms might have a different wall colour, Detailing that created a °gateway” landmark on the corridor could be used to signal when the resident had crossed from one room cluster into the next. It is these same kinds of colour changes and detailing that have proved effective as cues for wayfinding in dementia care units. The MLC Design Guidelines must consider care unit concepts that are feasible with normally-available staffing allowances for the average care population in a stand-alone Multilevel Care Facility. 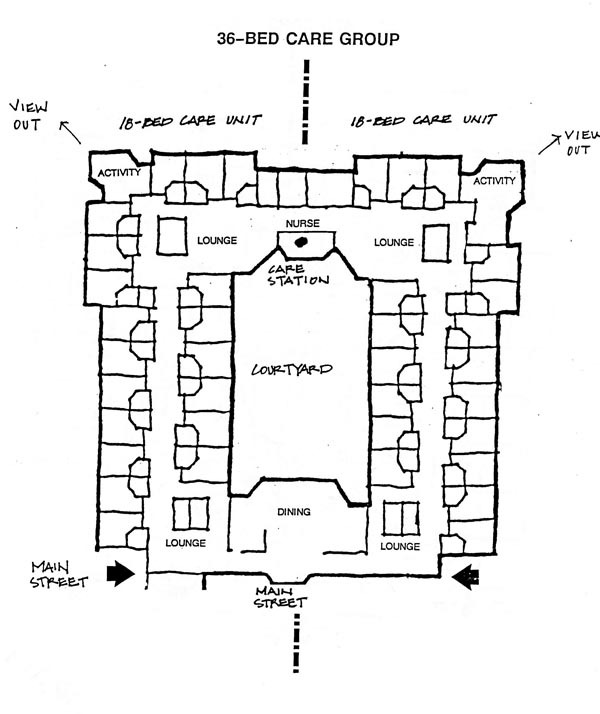 However, the basic concepts of linking two care units for more effective staffing can be used to link two 18-bed care units to form a 36-bed care unit around a courtyard (See Fig.3-8). The 18-bed care unit also can be configured to create two room clusters each served by a separate lounge. Two different concepts for linking two 18-bed care units are explored in the next section. One links the two care units around a courtyard. The second layout arranges two 18-bed care units of resident rooms around a central core of common support functions. Both allow the linking of the corridors in two adjacent care units to provide more effective staff circulation and to provide extended walking loops for residents in a efficient way. We have deliberately presented a variety of care unit schemes in this section to indicate that we fully expect that individual care providers unique to their resident’s care needs and their surroundings. Innovative care unit schemes must meet the goals of providing the smallest number of beds in a care unit that is feasible for available staffing and then subdividing that beds in the care unit into smaller room clusters. These smaller room clusters served by small lounges are the way that care unit design can encourage the forming of small social groups which are more effective for care of the physically and mentally frail. In the next section 3.4 Design Principles for Care Units, we illustrate the Design Principles that the Review Committee recommends as common elements in all future care unit designs. It is essential that the revised Multilevel Design Guidelines continue to give strong direction about desirable characteristics in care unit layout. The Design Guidelines also continue to give flexible direction that allows particular care providers and their architects to develop innovative care unit designs that meet the challenges of particular resident groups and sites. The care unit should provide positive meaningful stimuli to residents. Examples of positive stimuli are outdoor views, views of active functions, food aromas that whet appetite, birdsong that signals morning and hushed sound that signals the end of day. Negative stimuli includes particularly distracting noise glare and too many unfamiliar faces. Staff and service delivery personnel and material movement should not create through traffic in a care unit. In the MLCDG planning interviews, one general belief was that a desirable care environment for all types of residents would be one which provided positive meaningful stimuli for all five senses and controlled negative stimuli, particularly noise. The amount of stimuli desirable varies depending on the specific resident. The conclusion was that the basic care unit design should take advantage of natural opportunities for providing positive stimuli (outdoor views, views of active functions within the care facility, openable windows for natural sounds etc.) and control negative stimuli including noise and glare. The great need to control noise was emphasized. Examples noted were the disembodied voices that issue from intercom systems, floor polishing equipment, and the noise of many people talking and servery sounds in large dining rooms that makes it hard for the elderly to hear conversations at their own table. Sound control is further discussed under 3.4.10 Finishes. 19 Henderson, J.Neil, PHD. The Unique Culture of the DSCU, Conference on Dementia Specific Care Units: Putting the Pieces Together, April 1993. 20 Calkins, Margaret, Design for Dementia, 1988. 3.4.1.1 Each care unit should have an interior walking loop. 3.4.1.2 Consider linking the internal walking loops in adjacent care units that form a care group. 3.4.1.3 It is effective therapeutically to create this internal walking loop from “normal” circulation that links strategic areas of the care unit (dining, activities, lounge, etc.). This gives points of interest along the route that can give the resident the sense of meaningful journey and arrival that can encourage stops for rest rather than the purposeless endless walking (with the corresponding dangers of continuing weight loss). Because the internal walking loop is created from “normal circulation”, the circulation space is increased only as needed to create a continuous loop and avoid dead ends. 3.4.1.4 The walking loop needs to be independent and internal to the care unit to maintain the units security. The capability for exit control is needed if every care unit is to have the flexibility to care for residents with “severe behaviour dysfunctions”. Every care unit needs to have its own internal walking loop and exit control capability to give that care unit the capability to house residents with severe behaviour dysfunctions who require care in a secure unit. When this same care unit is used for residents who do not need a closed unit, the care unit entry door can be left open to the rest of the care facility. Fig. 3-9 shows a care unit which is part of a care group with an internal courtyard and an efficient walking loop which has exit control capability. Fig. 3-10 shows the more extensive walking loop created when the two adjacent care units are connected. Fig. 3-11 shows a care unit which is part of a care group with central common areas and a shorter walking loop which has exit control capability. Fig. 3-12 shows the more extensive walking loop created when the two adjacent care units are connected. 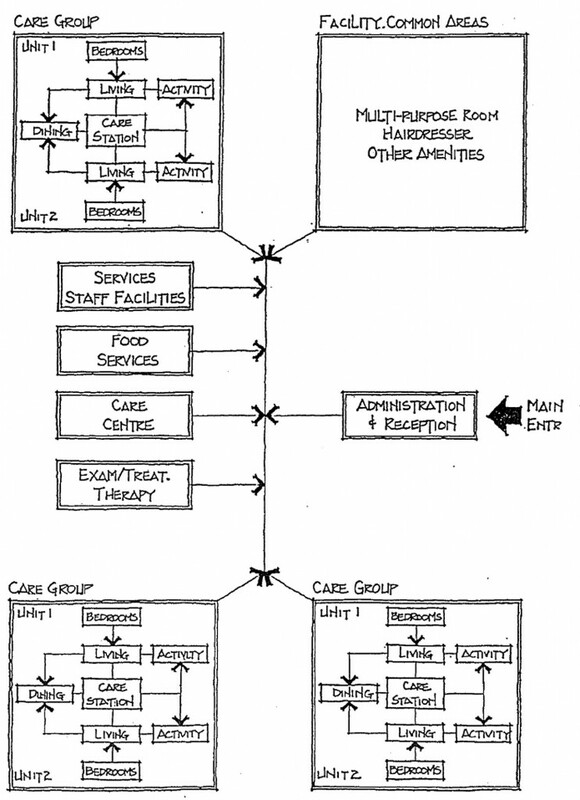 The care unit examples in section 3.3.4 illustrate some of the many variations that have been developed within the two main types of care unit schemes. The average population in facility care is projected to be 10% IC2, 45% IC3 and 45% EC for the next 5 to 10 years. The Continuing Care Division has stated that the Ministry wants all care units to be flexible for care of all future residents because the numbers of beds in a facility required for specific types of care shift frequently. By implication, then all care units should be flexible for care of severely cognitively impaired residents with behaviour dysfunctions (who form the bulk of the IC3 population projected for future facility care). This basic assumption was supported by 86% of the reviewers in Phase 1. Does every care unit need a walking loop internal to the care unit to support care of severely cognitively impaired residents with behaviour dysfunctions who are still ambulant or is it sufficient to have some units with internal walking loops and some units which only have access to walking loops nearby? 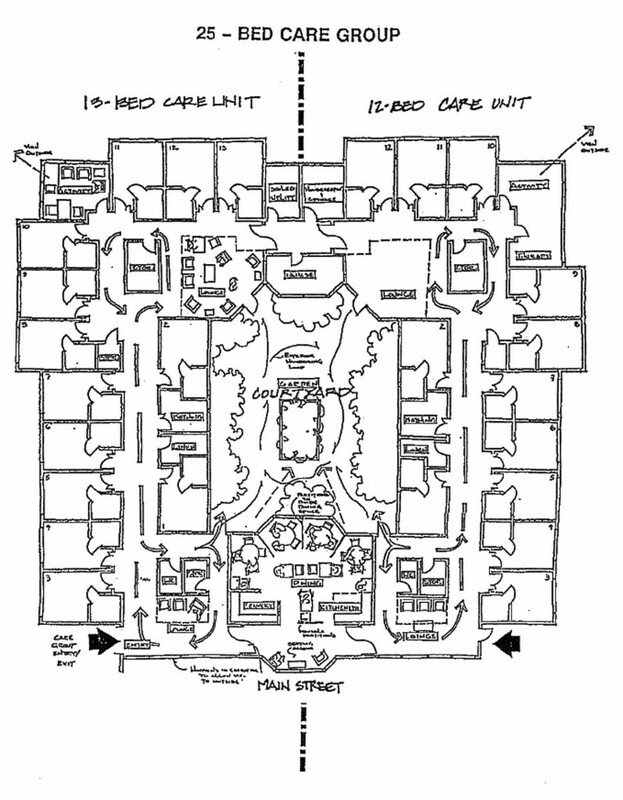 Several of the care unit layouts in Section 3,3.4 were shown to the Working Committee to demonstrate that the walking loop (properly designed) is created from the normal circulation of the care facility, with the extra space needed to ensure that it is a continuous path without dead-ends. The preliminary concept is that the internal walking loop could be added in every care unit by increasing the net to gross multiplier from 1.4 to 1.6 for the affected sections of the care facility (as defined in Introduction 1.5). if we agree that all care units in a facility should have the flexibility for care of any resident group with cognitive impairments and/or behaviour dysfunctions, then every care unit should have an internal walking loop. To provide a supportive environment that accommodates the walking behaviour of dementia residents recent special care units that are purpose-built for dementia care have included an internal walking loop. It is effective therapeutically to create this internal walking loop from “normal” circulation that links strategic areas of the care unit (dining, activities, lounge, etc.) as described above. This gives points of interest along the route that can give the resident the sense of meaningful journey and arrival that can encourage stops for rest rather than the purposeless endless walking (with the corresponding dangers of continuing weight loss). Because the internal walking loop is created from “normal circulation’. the circulation space is increased only as needed to create a continuous loop and avoid dead ends. The walking loop needs to be internal rather than adjacent to the care unit so that every care unit retains the capacity to become a secure unit. The capability for exit control is needed if every care unit is to have the flexibility to care for residents with “severe behaviour dysfunctions”. The Review Committee members have emphasized repeatedly that care facilities house very diverse residents. The capability to cluster different small groups of residents in separate care units that are almost self-sufficient is essential. For example, a small group of residents with severe behaviour dysfunctions that endanger other residents require a secure unit with a loop for pacing to cool down, Clients in the later stages of Alzheimer’s may also require a secure unit but these two groups of residents should not be housed in the same secure unit. All the care units need to have the flexibility to house resident groups that require walking loops for appropriate care because the specific types of resident groups in a facility shift unpredictably over time. Providing internal walking loops in every care unit will also benefit any other resident groups who might be housed there. By providing a clearly defined and attractive circulation path within the residential care unit and care group, all residents can be given a chance to enjoy exercise (by walking or by wheelchair) within their own home. This is an important substitute for more active forms of exercise for the very physically frail elderly who form most of the population of care facilities. The preliminary concept is that the internal walking loop can be provided by increasing the net to gross multiplier to 1.6 from 1.4 for the care unit areas of the facility. We believe this change in net to gross multiplier will be sufficient because it has been adequate for the Special Care Units designed in the past. Staff workloads for care of the large number of severely cognitively impaired residents may well be eased by the internal walking loop making it less necessary for staff to chase residents or help them out of dead ends. If so, then the increased capital cost may be offset by the care unit environment making it possible for current staffing levels to handle residents with increasing care levels. The need for an internal walking loop and the cost factors involved are among the issues the Ministry would consider in making the final decision on whether every care unit should include an internal walking loop. For the purposes of this project, the consultant recommends that an internal walking loop created from needed functional circulation be included in every care unit. This recommendation was accepted by the MLCDG Working Committee as the basis for the revised guidelines. 21 Former Care Director, Gorge Hospital. Victoria: Personal Communication, September 1994. Single-loaded corridors in the care units of 1830 mm minimum width will be considered for approval by the Ministry if an equivalency has been obtained from the local authorities having jurisdiction. Double-loaded corridors in the care units and all corridors in the main facility will have a minimum of 2400 mm corridor width. Corridor lengths should be minimized in consideration of the need for home­like environment and efficient staff circulation. At the same time the corridors in the care unit need to form continuous walking loops for residents. Moving beds in corridors: B.C. Building Code requires 2400 mm. Residents in wheelchairs passing in corridors. Persons with moderate to severe dementia and/or behaviour dysfunctions walking past each other in corridors. In single-loaded corridors in care units, architectS has applied successfully to individual jurisdictions for an equivalency to the B.C. 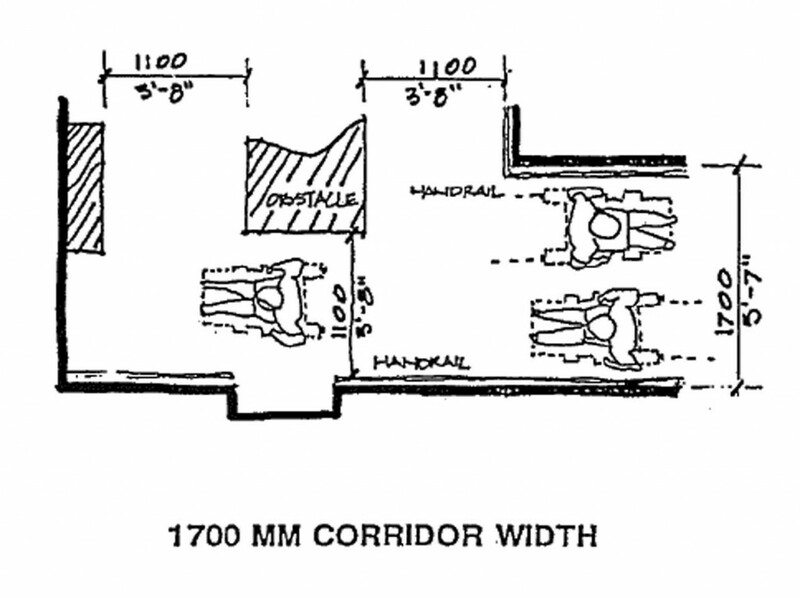 Building code required width of 2400 mm (7’­10″) that allowed a corridor width of 1830 (6′-0″). Where this equivalency is allowed by the authority having jurisdiction, the reduced corridor width allows the footprint of the building to be smaller which can be of great use on restricted urban sites. The 1830 mm single-loaded corridor width also provides a more home-like appearance for the care unit. One of the most effective ways of applying for a Building Code equivalency to reduce the width of a single-loaded corridor in a care unit to 1830 mm is to have the care facility owner take responsibility for stating in a letter to the local jurisdiction that beds containing residents will not be moved in the care unit corridor. (Bed movement of residents is usually prohibited in the evacuation plan because of the corridor congestion that would result (see below). With this kind of letter from the owner and detailed information supplied to the local authorities having jurisdiction architects have been successful in obtaining Building Code equivalencies. In a recent care facility design, the architect was successful in obtaining a code equivalency for reduced width of a single-loaded corridor in the care unit by providing the local authority having jurisdiction with a detailed analysis of bed turning movements. This analysis showed that with the particular configuration of the single-loaded corridor of 1830 mm, (and the recessed lay-by areas at pairs of resident room doors which gave a total width of 2280 mm) it was possible to turn a bed out of the room and into the corridor. The analysis also indicated that beds would be moved in one direction only and would not need to pass each other. The evacuation plan in most facilities prohibits moving residents (intermediate or extended care) into the corridors in their beds in an emergency situation because the beds would create a traffic jam that would prevent exiting through the corridor. The normal provision in an evacuation plan for the residents who are in the area of the fire and/or severe smoke is that the care staff are instructed to use the bottom sheet to lower the resident from the bed to the floor and then drag them into the corridor to the zone of refuge. In the case of residents in rooms distant from the area of the fire, it is normally considered safer to close the doors to those rooms to prevent smoke spreading while firemen control the fire in the other part of the facility, than it is to move the residents. Therefore, it is fair to say that moving of residents by bed during a fire condition is against the recommendations of most evacuation plans. The next question is whether residents at extended care levels would be moved in their beds under normal operations. In older extended care hospitals with most rooms in either four bed wards or double occupancy rooms, beds have been used to move extended care patients in and out of rooms. It was generally stated that with most beds in a multilevel care facility in single occupancy rooms, the beds are not used to move extended care residents in normal operation or during emergency evacuation. In normal operations when a resident needs to be moved, he or she would be placed in a wheelchair. When a resident is very ill, under most conditions physician visits and other care are provided in the resident’s own room. When an acutely ill resident is moved on to an acute care facility, the resident would be most frequently be moved either by wheelchair or by ambulance gurney. Therefore ft would appear that corridor widths must accommodate bed turning movements only for moving empty beds in and out of the room during initial occupancy of the building or on the rare occasions that the entire bed might need replacement. The next issue is the space required for two wheelchairs to pass each other in a corridor. Two wheelchairs will need to pass each other in any corridor, be it single-loaded or double-loaded (although there may be more traffic on a double-loaded corridor). The issue of clearance between the wheelchairs is significant because care facility residents operating the wheelchairs need more room because of their cognitive impairments and/or physical disabilities. However, cognitively impaired residents tend to cling to the sides of the corridor and often pull themselves along by the railing. 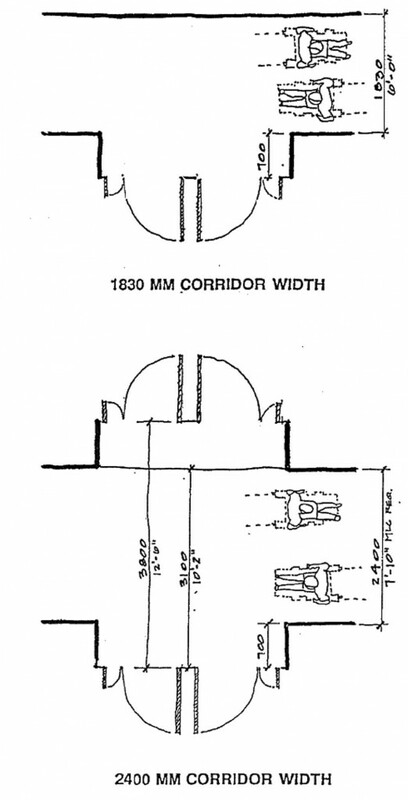 Therefore 1830 mm corridors are certainly adequate for two wheelchairs to pass each other. As a result of standard room sizes these lay-bys tend to occur at regular spacing in the corridors about 6000 mm (20 ft.) on centre. These lay-bys can be easily used by one resident in a wheelchair as a retreat area when another resident in another wheelchair is passing in an 1830 mm corridor. Therefore 1830 mm (6 ft.) single-loaded corridors in a care unit will provide more than adequate width for two wheelchairs to pass each other. Several care providers reported that the 2400 mm corridor also makes it easier for people with moderate to severely dementia and/or severe behaviour dysfunctions to pass each other in a corridor without interference, added confusion or conflict. The regularly space lay-bys in front of resident room doors at 6000 mm (20 feet) on centre make the 1830 mm corridor in this configuration more than adequate for demented people to pass each other. Care unit schemes which contain occupancies adjacent but not separated from the egress corridor will require an equivalency under the B.C. Building Code. Commentary: A care unit layout with central open spaces inside the corridor loop will require under the B.C. Building Code an equivalency from the local authority having jurisdiction. The circulation space between the resident rooms and the central common areas is considered as the access to exit under the B.C. Building Code, The Code requires fire separations between the exit corridor from the resident room and space that is used for other purposes. The onus is normally on the individual architect for a particular project to negotiate a code equivalency with the authority(ies) having jurisdiction as defined by the B.C. Building Code. Mitigating features to improve fire safety are required. Railings around the open central spaces and smoke baffles overhead are often included in the additional features required by the individual jurisdictions. To make it easier to use open central common areas in care unit schemes, the Ministry of Health could negotiate a building code provision with the Ministry of Municipal Affairs that would allow care unit layouts with open central common areas in sprinklered buildings when specified additional design features were provided to resolve fire safety concerns. The advantage of a provision in the Building Code for the Ministry of Health and care providers is that this reduces one of the time-consuming aspects of a care facility design. A Building Code provision like this would give local building inspectors the authority (if they chose) to allow central common open spaces in care units under specific conditions. This would allow the architect and other members of the design team to concentrate their efforts on the many other challenges in designing the care facility. Handrails must be provided on both sides of the care unit corridors mounted at a recommended height of 840 mm. Corridor detailing should be developed to protect the walls from wheelchair damage. Commentary: Many care providers have reported wheelchair damage along the walls from residents dragging themselves along by the handrail. High baseboards protect walls from wheelchair damage. One example of away to protect the wall is a 200 mm (8 inches) carpet baseboard with 50 mm (2 inch) trim above. Another variation is a high baseboard made entirely of wood, however this can get damaged by rubbing. It is most effective to provide a combination trim like the one first described where the projecting upper trim helps offset the wheelchair from the main wall surface (including the carpet baseboard) and therefore minimizes damage. 3.4.3.1 Each care unit should have the capability for exit control (when needed) from the care unit to the rest of the facility, and from the care unit to outdoor areas. 3.4.3.2 Exit control, when needed, should be unobtrusive and immediate. 3.4.3.3 For the safety of residents a flexible exit control is needed to provide control particularly from the care unit to the secure outdoor area. Commentary: Best Practices: An Environmental-Behaviour Model for Alzheimer’s Special Care Units 22 analyses the issue of exit control and determines that the most effective exit control system is one which provides immediate control of exiting but is relatively unobtrusive. One example of an unobtrusive exit control system which is still immediate would be an unobtrusive lock on a door intended for staff use only. An example of a flexible exit control system is the electronic key pad system. When the key unit is placed high on the door it is less obtrusive. When the layout allows a location for exit control, the key pad system is one way of providing exit control when needed for a particular resident group, or at particular times,and providing open access when that is appropriate. This is a major issue for resident access to the outdoor area which is normally open but needs to be controlled during inclement weather and cold nights. 22 Zeizel, Hyde, Levkoff. Best Practices: An Environment-Behaviour Model (E-B) for Alzheimer Special Care Units, The American Journal of Alzheimer’s Care and Related Disorders and Research, March/April 1994. 3.4.3.4 Overall security and separation of the unit is an important factor in creating peace of mind in resident, staff and family members. Technology should be used to control exits and to ensure residents do not access service areas. Each care unit should have direct access to its own independent outdoor area where site conditions allow. This outdoor access should have the capacity for exit control when conditions are unsuitable (bad weather, cold nights). The outdoor area which serves a care unit should have the capability for exit control when needed to control access into other outdoor areas. The outdoor area should have a clear continuous walking loop located so as to allow observation by staff from inside the unit. When staff are able to check easily for resident safety on the outdoor walking loop, staff feel more secure about allowing residents to use the outdoor areas unaccompanied. Free open access to a secure outdoor area is preferred for dementia care. See Section 5.8 for detail. 3.4.5.1 Provide separate dedicated space for dining, lounge and .a space for activities. Common areas used by residents of the care units, care group and the facility common areas used by all residents are detailed in Section 5. Commentary: In the facility tours included in the Phase 1 planning interviews, we saw several examples of multi-purpose dining and activity areas. The care providers reported that activities were always being curtailed by meals and dining area preparations. 3.4.5.2 The dining areas for two adjacent care units can be located together, as long as there are flexible ways of dividing the space into smaller areas. 3.4.5.3 Activity areas from two adjacent units could also be co-located to provide flexibility for larger special activities. However for normal use, the activity space would be divided by movable walls into an activity area for each care unit. Sound control will need to be considered (see Section 5). Commentary: Depending on the size of care unit used, dining areas may need to be combined to make staffing reasonable. The example given was that two separate dining areas for 12 residents would need more staff than one dining area for 24 residents. Some flexibility to combine part of the activity space allowances for two adjacent care units may also be required to accommodate the need to house small and large activities for alert residents. At the same time, these combined spaces must have design features that allow socialization on a manageable scale. Movable walls are one suggested approach. 3.4.6.1 Views to the outside should be available from common areas and resident rooms in a care unit. 3.4.6.2 Active views (traffic moving, children playing, etc:) are more desirable than passive views from the common areas. Commentary: A significant concern was expressed about care unit layouts without outdoor views from the common areas. A common layout for a care unit achieves an internal walking loop by locating resident rooms on the exterior and open common spaces in the interior surrounded by the walking loop. Views to the outdoors from these common spaces were considered essential by most care providers. During the stages of moderate to moderately-severe dementia, watching will likely be one of the most significant personal or small-group activities. The need for outdoor views for dementia care residents was supported in the interviews. One care provider reported residents with significant dementia had less behaviour problems when they had a construction site to watch across the street. 3.4.6.3 Views from the care unit common areas in a courtyard scheme should be a mix of views out to the care facility grounds and views into the courtyard. Consider using some of the common areas of the care unit to create a “front porch” or entry for the care unit. Residents in the “front porch” area would have views of higher activity spaces of the overall care facility. 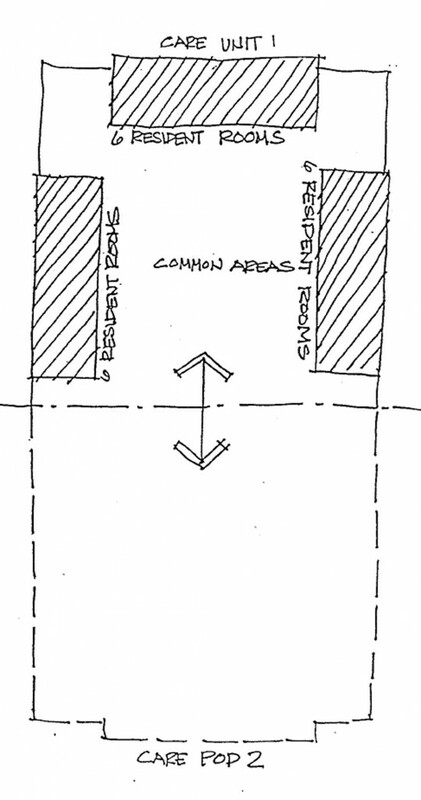 This area can help to satisfy the residents’ urge to gather where they can watch people coming and going. Functions in the care unit should be located to provide a transition from the common spaces such as the lounge, dining and activity areas to the most private spaces like the resident bedrooms. Traffic through the private spaces should be minimized consistent with a home-like setting. 3.4.9.1 All finishes and colours in a care facility should be selected to give meaning to the care environment emphasizing landmarks and other features which make it easier for residents and visitors to find their way. Commentary: The finishes and colours in a care facility should be carefully selected to make it easier for all residents, including the cognitively impaired, to identify their own care unit and room to find their way (when appropriate) to the common areas in the overall facility (hairdressing salon, multi-purpose room, etc.). Care Office Transition between one resident room cluster and the next resident room cluster. Entries to each of the key common areas: dining, activities and lounges. 3.4.9.2 Consider using finishes and colours in the care unit to emphasize the room clusters that form smaller social groups. This can also aid with way finding. Commentary: When there is more then one lounge or activity area and each one is assigned to a separate resident room cluster a related colour scheme between the common area and the hallway for the resident room cluster can help emphasize this connection. The correlation of a social gathering area and a resident room cluster are two of the key elements needed to encourage the formation of the small social groups that are effective for care of the cognitively impaired. Small social groups are also beneficial for the very physical frail elderly by helping them use their remaining strength most effectively to gain the maximum social and mental stimulation from the daytime activities. 3.4.9.3 Selection of colours and finishes should pay careful attention to the visual impairment which is characteristic of increasing age. It is essential that there be sufficient contrast between a door frame and a door, for example, to help the resident see the door. The same applies to door handles, cabinet pulls, etc. In the inverse, when a doorway is intended for use only by staff by having the door and frame in the same finish and colour as the wall and having the locking or handle mechanism unobtrusive will make it relatively likely that the cognitively impaired resident will not be as aware of its existence. 3.4.9.4 Residents with visual impairment will have perceptual difficulty with a reflective finish. Flooring materials should be low glare easily maintainable surfaces which also cushion falls and absorb sound. It is also helpful to avoid bright white walls for the same reason. 3.4.9.5 Adequate contrast of finishes and colours is particularly important in the bathing area. Avoid use of materials that will increase the walking difficulty of residents with gait disturbance or impede easy movement of residents in wheelchairs. Carpet absorbs sound, avoids glare, cushions falls and contributes to a residential character. Carpets are now available which meet the concerns for stain control and movement of wheelchairs. Only direct glue-down carpet installations are recommended (no carpet under layment). Consider carpeting as a floor material for the corridor and other common areas of the care facility, with the exception of those areas where the need for a particularly cleanable surface or water resistance is an issue. For example, carpet should not be used in the dining area, resident kitchen or bathing area. Carpeting should not be used as a standard floor material for resident rooms, however it can be considered for particular resident rooms with justification made for its use. Consider ceramic tile in those areas subject to high humidity and moisture. Use a non-slip tile finish in the bathing rooms and resident washrooms that are used as showers. Commentary: Too frequently the bathing room finishes include light coloured glazed wall tiles which blend in with the light coloured bathing tub. This scenario leads to general confusion for a visually impaired elderly person. When you add the unfamiliarity of most residents with an assisted bathing tub and the presence of some stage of dementia in the great majority of residents, this can lead to highly disturbing episodes in the bathing area. Imagine what it would be like, if you were suddenly brought into a room that was filled with fog and someone took away your clothes and your glasses. You would be cold and afraid and unable to identify the loud bubbling sound. Suddenly a strange lift which you could not see easily picked you up and dangled you high in the air over a bubbling inferno which steamed. Is it any wonder that catastrophic reactions occur so frequently in the bathing area of the facility. In contrast to this disturbing picture, it is possible to use the colours of wails, floors and fixtures to make the bathing area a more home-like and familiar place. For example, the use of a light coloured tile wainscot which contrasts with a medium coloured upper wall produces a border effect which tends to make the bathing area feel smaller and more like a bathroom at home. A wallpaper border is sometimes used to the same effect. It is equally important that residents be able to see the towels and this can be a reason for coloured towels vs. white towels. In the same way, it is particularly important that residents be able to locate the assisted-bathing tub easily so that the strange sounds of the whirlpool equipment, are less disturbing. Perhaps one of the most practical ways of doing this is to contrast a standard white assisted-bathing tub with a medium coloured floor and walls. Commentary: Carpet used in a number of care facilities received positive comments from staff and residents alike. The exception was the use of carpet in residents rooms. There the reaction has been mixed, with some residents and staff approving the residential character and others having significant concerns. Carpet may be appropriate in some resident rooms but must be avoided where residents have incontinency. Heat Welded Seamed flooring with a no wax non-glare finish provides a warm floor finish and as an appropriate flooring for areas where cleavability and water resistance is an issue. Examples include the dining area and resident kitchen areas. Carpeting should not be used as a standard floor material for resident rooms, however, it can be considered for particular resident rooms with justification made for its use. it is important to minimize changes in floor finishes. Junctions between floor finishes changes in colour and strong pattern can be difficult for residents due to gait disturbances and perceptual problems. Commentary: Changes of floor materials in the care facility should be avoided where possible and detailed carefully when they are needed. Residents with moderate to severe impairment sometimes see changes of floor material and/or changes of floor colour as barriers over which they cannot pass. It is believed that a dark patch of floor in contrast to a light area of flooring looks like a hole in the floor to the cognitively impaired resident. This is the suggested cause of the odd postures and anxiety when a resident with moderate to severe dementia is trying to cross a black and white tiled floor. When changes in floor material are necessary, the junctions need to be carefully detailed because they will otherwise become a hazard leading to resident falls. This can occur because the change in floor material becomes a maintenance problem and then through use, (particularly use with wheelchairs) eventually lifts up and becomes a hazard for tripping. This is a particular problem with the shuffling walk and other gait disturbances of advanced dementia. 1. All receptacles in resident care areas should be tamper-proof type. 2. Fire alarm pull stations should be of the guarded type. 3. Security systems can be utilized but should have the emphasis placed on exit door locking in conjunction with alarms rather than monitoring. There are several types of wandering resident alarm systems available but the total function and reliability of these systems need to be carefully examined. The design of the physical space should try to maximize control and supervision of residents and discourage any walking away from the facility, thereby reducing the requirement for electric type controls. Code regulations must be complied with. Motion sensors in residents rooms connected to nurse call alarm system may be appropriate during the time when residents are sleeping. 4. Nurse call system resident bedside stations should have geriatric cord sets. 5. Soothing background music systems can have a calming influence on residents. Intercom and paging systems are not recommended. 6. Lighting systems should be capable of offering a range of different lighting levels to make use of available daylight and also take into consideration the different activities of the residents. Supplemental incandescent lighting could be provided in order to make use of any dimming requirements and halogen lighting can help achieve a homelike appearance. Generally illumination levels should be higher than recommended minimums prescribed in Section 11. Lighting levels should provide an even distribution throughout different areas to help reduce shadows and glare. The use of indirect and/or louvred fluorescent fixtures installed out of the normal field of view is also recommended for overall illumination. Supplementary lighting in the form of table or stand lamps may be utilized for task (reading) lighting. Fluorescent lamps should be warm white or daylight type. 7. Light switches for corridor lighting should be located at the care centre; night light switches in resident rooms may be of the illuminated type and should be located at the bed head and the entrance door. 8. Radiant heating panels (ceiling mounted) should be used in lieu of baseboard heaters. 1. Sprinkler heads should be the concealed or recessed type. Nearly all beds in a care facility should be single-occupancy rooms with the percentage of total beds allowable in double-occupancy rooms to be determined by the Ministry of Health (currently 10% see Volume 2). Commentary: The current Ministry of Health Continuing Care guideline is that 10% of the beds in a care facility can be in double-occupancy rooms with all other beds in single occupancy rooms. The percentage of beds in double occupancy has been varied where justified through application to the Ministry. The 10 percent guideline was placed in Volume 2 to allow the Continuing Care Division the ability to adjust the occupancy rate in care facilities based on overall demand without having to continually update the guidelines. It has been noted by one of the Review Committee that the percentage of beds funded in a care facility in double occupancy is one issue and the design for potential occupancy is another. For example, a care provider may choose to physically build a space with the potential for 125 occupied beds with the understanding that only 100 beds would be funded today. In the future, if demand justifies, that care provider might apply to the Ministry to increase the number of funded beds in double-occupancy. Consider providing interconnecting doors between two single rooms to allow the flexibility for a married couple or two roommates to share those rooms as a suite. Using the concept of connecting two single rooms as a suite does not preclude providing double-occupancy rooms, if the care provider so desires. Commentary: Some care providers may choose to use the interconnecting door concept as a flexible way of providing spousal rooms or roommate suites, When one resident dies, the surviving partner can stay in her or his home. The interconnecting door can be locked and the and the second room assigned to another resident. Using the concept of connecting two single rooms as a suite does not preclude also providing the normal allowance of beds in double-occupancy rooms, if the care provider so desires. However, some providers have chosen to have only single rooms in their care facility and have used the interconnecting door concept as the most flexible way of providing accommodation for residents who want to share living space with a spouse or roommate. The desired bed location should be determined early in design. Consider the proposed bed location in the placement of the nurse call system, reading lights, switches, other room controls and bed-head bumper rails to protect wall against damage from bed movement. To reduce incontinency in some residents it is useful to have views from the bed location to the toilet. Commentary: The Consultant and some reviewers noted that current room space allowances do not allow flexibility far alternate bed locations with wheelchair access. Providing roam controls at two locations was also considered impractical with current technology. The consensus that the desired bed location should be determined early in design was approved by the Working Committee. The ensuite washroom location which is preferred is one that provides privacy for the resident when the door to the resident room is opened and is visible from the bed location. All equipment, ergonomics and furniture in the residents room is to be laid out in accordance with currently accepted ergonomic guidelines and the recommendations of the WCB. Without moving adjacent beds or furniture, except chairs, it should be possible to move any bed into or out of the room. A minimum 1200 mm wide passage for such movement shall be provided within all bedrooms. At least 1200 mm clear space between beds is required for nursing care, to assist people into wheelchairs, and for operating person lifting devices and stretchers. This space shall be unobstructed by tables, etc. Wall-mounted cupboards between the beds cannot be accepted as they interfere both with management of the person and the person’s freedom to manoeuvre into and from a wheelchair. The other side of the beds shall have a minimum of 900 mm clearance for manoeuvring room. it is desirable that every resident in a multiple bed room have a direct view out of an adjacent window from their bed position. Certain architectural features can unnecessarily restrict the views of those confined to bed. Consideration of resident views must take priority over architectural aesthetics. Door openings into bedrooms from corridors shall have a clear minimum width of 1200 mm to allow for the movement of beds and, if designed with two opening leaves, should have a minimum opening width of 900 mm for normal usage. Locking hardware on resident bedrooms will generally not be allowed but, depending on the level of care and acuity of the resident, the flexibility should be available to install locks if required. Door openings from resident bedrooms to the resident en suites shall be no less than 900 mm wide. Sliding or folding doors are not generally considered suitable for use by residents. An openable window is desirable (and required if mechanical ventilation is not provided). The opening location and size of opening needs to be safe for the cognitively-impaired. The window needs to be operable by the physically-frail. Window sills should be low enough to permit a view out and down from a low bed or wheelchair position. Window openings must be strong enough to withstand abuse by residents and restricted to prevent egress. Window drapes need to be installed with quick-release fastenings so that they cannot be ripped. Use of draw cords must be avoided. Commentary: The window and hardware selected needs to stop the window opening at a point which prevents cognitively-impaired residents getting their legs out or other misadventures. Some care providers reported strong male dementia residents being able to break open the window stops. Another concern is that a resident in a wheelchair can most easily operate a window at a low position. However some care providers note that for safety of the cognitively-impaired, the openable section of the window should be placed high in the glazing. Some care staff also complain of residents leaving windows open or closed unreasonably. This situation is eased by the latest Ministry policy of providing mechanical ventilation in care facilities. The openable window is still desirable for the resident’s added wellbeing. However the ventilation and comfort are not as dependant on the window as in the past. (The window stop also minimizes the effect of the window destabilizing the building climate.) Where the window stop and window type are not considered sufficient to ensure resident safety, unobtrusive window locks can be added for safety (to be used only when absolutely necessary). In multiple bed rooms mounted curtain tracks shall be provided for privacy screening of beds. The curtains, if full height, shall be fitted with mesh at the top for air circulation. A clear space of at least 300 mm should be provided between the foot of the bed and the privacy curtain, and the track must provide for the resident nearest the door to be screened from view from the corridor. The space allowance for residents beds shall be 2200 x 1000 mm. Bed heads should be constructed to allow for clamping on self-help devices such as a trapeze. Safety aides should be the sliding type, with clamp fasteners fastened to the bed frame, but some beds may be fitted with half sides for assisted transfers. All beds in a facility should be of the high-low type. In each bedroom provide individual resident wardrobe. Provide a minimum space of 0.5 m2 . Consider designing the wardrobe with two sections, a small unlocked section for one day use clothes and a larger locked section for general clothing storage. Provide a free-standing bedside bureau for each resident’s personal belongings. May also be designed to contain a washbasin and bedpan. Alternative arrangements may be made for storage of the washbasin and bedpan in the bedroom or bathroom areas. Provide space 600 x 600 mm. Refer to Figs. 3-16 to 3-18. Area to be provided for armchair and space for a personal item of the resident’s own furniture. Piped gas is not necessary but may be permitted in some multilevel care facilities. Oxygen which may be required can be satisfactorily administered from portable equipment including concentrators. When not in use by residents the equipment must be stored rooms approved for the purpose. Suction equipment of the portable electrically operated type is considered to be satisfactory. Provide a nurse call system in the resident room. Design features that provide the opportunity for residents to personalize the room are highly desirable. See Figs. 3-16 and 3-18 which show the recommended bed location for privacy and two alternate bed locations. For two inconnecting rooms space allowance 42.0 sq.m. See Fig. 3-18 for suggested layout of double occupancy room. Space allowance 33.0 sq.m. Fig. 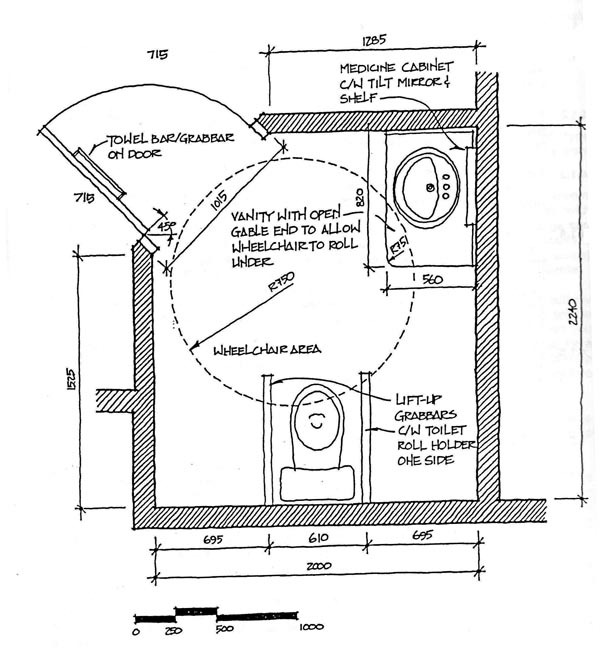 3-19 illustrates an ensuite washroom arrangement. Note wheelchair turning radius requirement. 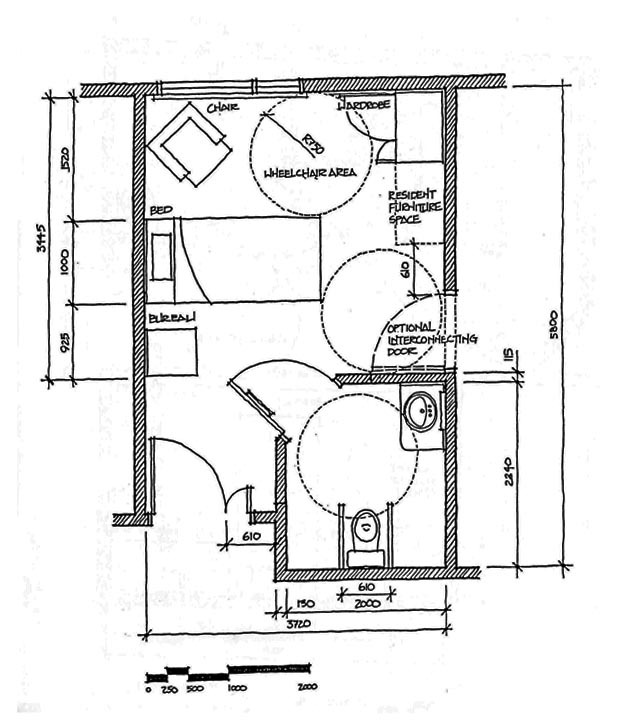 An ensuite washroom containing a toilet and vanity with washbasin is required in every resident room. All ensuite washrooms should be wheelchair-accessible and be provided with swing-up grab bars beside the toilet. Consider removing the ensuite washroom door in certain circumstances to ensure the resident has a clear view of the toilet from the bed location. See 3.5.3. Space allowance included in resident room allowance. Commentary: This point was emphasized throughout the MLCDG interviews. Ready access to an ensuite without having to wait for anyone else was also described as the main way (along with a regular hydration and toileting program) of avoiding the excess disability of early incontinence. With the cognitively impaired, sharing of ensuites can create additional confusion or conflict. The Counsel and Care study noted that 90% of the elderly surveyed who were not in a home but attended day centres wanted to have an ensuite washroom if they entered a care home. Of the 100 residents surveyed in 54 London care homes, 73% did not have ensuite toilets and over half said they wanted an ensuite. The Ministry policy of providing ensuites for all resident rooms responds to a preference expressed by the great majority of elderly. it is also a humane response to the toileting urgency that is a natural characteristic of all humans as we age. The ensuite washroom for a double-occupancy room will have one toilet and one vanity with washbasin plus a lockable storage unit for each resident, A second washbasin in the resident room is not required. space was still essential for staff helping a resident when toileting assistance was needed. Commentary: In the Phase 1 review some comments noted that cognitively-impaired residents sometimes use the second sink in the bedroom as a urinal. It was noted that the second sink in double-occupancy room was a holdover from the hospital model (staff handwashing) which does not contribute to “residential character”. Therefore it is proposed that double-occupancy rooms have only one sink. Provide suitable anchorage for all wall mounted fixtures. 2. Wall -mounted tank toilet. Flush valve fixture shall have a backrest mounted in front of the flush valve to support the resident. This should not interfere with the proper functioning of the hinged toilet Seat. A simple and domestic environment is the objective and for this reason the familiar tank-back toilet is recommended instead of the flush-valve alternative. Where tank-back toilets are used, the tank lid must be tightly secured to prevent violent residents causing damage and injury. The floor-mounted toilet is preferred over the wall-mounted toilet because of the advantages of cost and familiarity. The wall-mounted toilet has the advantage of making the floor easier to clean (see Volume 2 for Commentary). 1) Floor-Mounted Tank Toilet: The advantages of the fixture are its familiar appearance and back support for the elderly, and its reasonable cost and water consumption. The disadvantage is that it is harder to clean around a floor-mounted toilet. 2) Wall-mounted Toilet with Tank: The advantage is that it is easier to clean under a wall-mounted toilet. As a tank toilet, it also has the advantage of providing back support and reasonable water consumption. The disadvantages are that the fixture has a cost approaching that of a flush valve toilet. Two manufacturers supply the fixture but delivery times are longer. As a wall-mounted toilet, the fixture requires a special mounting carriage for wall support and increased wall thickness for the back toilet outlet and vent. 3) Wall-mounted with Flush Valve: The advantage of this system is the ease of cleaning and maintenance of the institutional fixture. This fixture is not familiar and residential in appearance. The unfamiliarity for the cognitively-impaired may offset any other cleaning advantages. The flush valve toilet also has significant cost disadvantages. Added expenses include the more costly fixture and plumbing, the special carriage for wall mounting and the need for increased wall thickness for the back outlet and vent. Flush valve toilets need more water supply than a tank back toilet. In some additions and retrofits, additional water lines are needed. 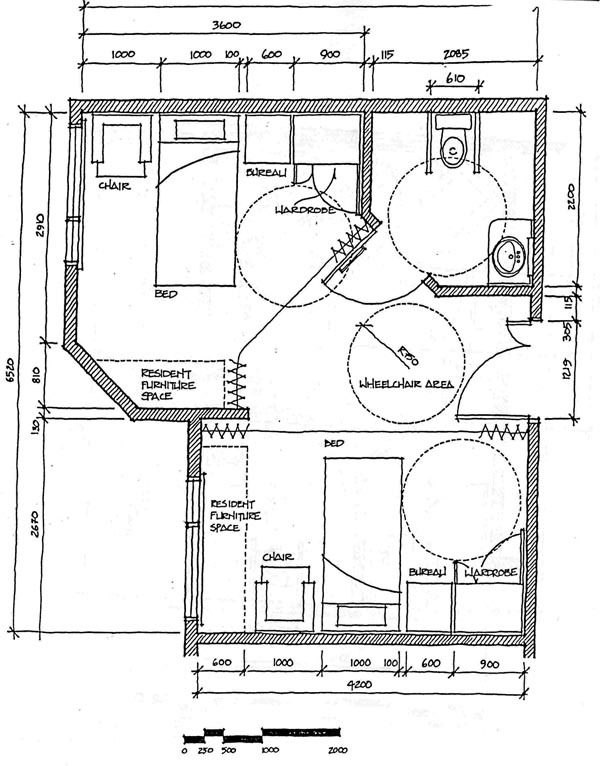 3.6.4.2 Toilets for resident use require a floor-to-rim height of 460 mm. The alternative of using a special toilet seat to raise the height of the toilet to wheelchair height can be discussed with Continuing Care. Any seat used to adjust toilet height must be fixed tightly enough to ensure safety and be easy to clean. Commentary: Some care providers have noted that wheelchair height toilets are too high for some ambulant elderly women who complain of dizziness and the risk of falls. It should be noted that the higher toilet height for wheelchair access also makes it easier for ambulant frail elderly to get up after using the toilet. The higher height is also needed in the first three months after hip replacement. 3.6.4.3 The toilet flush handle shall, if possible, be close enough to be reached by a person in a wheelchair (approximately 600 mm reach). 3.6.4.4 Provision of toilet seat restraint belts will be approved. Washbasins shall be provided for the occupants use and for the control procedures required of the health facility personnel. Each basin should be equipped with a gooseneck faucet with aerator head, 100 mm blade handles and pop-up waste. Adjacent to each basin, for staff use provide space for a paper towel, soap and protective glove dispenser and waste container. Confirm extent of this requirement with each facility. The washbasin shall be installed in a vanity (avoid sharp corners); otherwise, a shelf shall be provided adjacent to the basin. Behind each washbasin there shall be an adjustable tilt mirror mounted for use by both wheelchair and standing users. Consider utilizing the ensuite washroom as a shower room particularly useful for severely incontinent residents. The room finishes would need to be impervious to water and easily cleanable. The floor of the ensuite would slope to a faecal drain and be of non-slip impervious material. Controls for the shower should automatically maintain water temperature. A low pressure telephone type hand shower spray should be provided. Commentary: Utilizing the ensuite as a shower may be particularly useful if the residents are severely incontinent, however the sloped floor and wet environment may pose some danger when the ensuite is in use by the resident without staff assistance water ingress into the resident room also needs to be controlled. The ensuite washrooms may have, if required, approved bedpan flushing facilities comprised of a flexible hose connected to the adjacent washbasin via a diverter valve. Bedpan lugs may be provided on toilets where applicable. Unless swing-away or drop grab bars are provided, there shall be at least one grab rail, wall mounted, adjacent to the toilet, installed in accordance with B.C.Building Code requirements. See Fig. 3-19. Grab Bars must have a minimum of 30 mm diameter with a non-slip textured finish for use by residents who have arthritic hands. Towel rails are also to be designed to be used as grab bars. Provide a medicine storage cabinet for each resident adjacent to the wash hand basin. An emergency pull cord connected to the nurse call system must be accessible from the toilet to enable a resident to summon help. Provide one bathing area for each care unit or shared within a care group. This bathing area will contain one assisted bathing tub or a wheelchair accessible shower and a wheelchair accessible basin and toilet adjacent. Each assisted bathing tub will serve a minimum of 24 beds and a maximum of 36 beds. These ratios can be adjusted where justified through application to the Ministry. In a multi-storey facility there will be at least one bathing area for each care floor. Commentary: The basic bathing area concept of one bathing area shared between every two care units and containing one assisted bathing tub and one wheelchair shower has the advantage of providing a flexibility of bathing methods while at the same time providing a reasonable ratio of residents to assisted-bathing tub. That basic concept was supported by the Working Committee. However the ideal for privacy would be to have one bathing area in each care unit. The concern of the Working Committee is that one bathing area per care unit would result in too low usage of the assisted-bathing tub. The current MLC guidelines allow 5 _fixtures for 75 beds. consisting of 3 assisted-bathing tubs (1 to 25 beds) and two wheelchair showers. Some care providers during the Phase 1 interviews indicated that, with bathing teams, one assisted bathing tub could serve up to 40 residents. The existing Adult Care regulations would allow up to 92 residents to use an assisted-bathing tub. It was recommended that one assisted-bathing tub must serve a minimum of 24 beds and a maximum of 40 beds was accepted by the Working Committee. With a provision to ensure adequate usage of assisted-bathing tubs funded by the Ministry, it was determined that a care provider should be allowed to divide the bathing area allowance to provide one bathing area per care unit if desired. The bathing area should be designed to have an appearance that is as small and residential as possible, yet provide room for staff to assist the bather. The use of familiar “home bathroom” details can help the cognitively-impaired resident recognize the purpose of the bathing room and help overcome the discomfort and fear produced by the unfamiliar appearance of an assisted-bathing tub. To maintain privacy the bathing area is intended to accommodate only one bather and necessary staff at a time. Commentary: Examples of design features that can assist with a small residential appearance include wall finish details (contrasting wainscot or border or wall colours) that make the room seem smaller, a vanity counter with residential lighting, accessories, etc. To avoid an institutional atmosphere, some care providers place the bathing schedule and other notices inside a cabinet door for use by the bathing assistant only when needed. A wheelchair accessible shower should be included to assist in cleaning incontinent residents. A shower is also the preferred bathing mode for some residents. The showers should be designed to facilitate bathing residents in “shower chairs” as well as being provided with a hinged seat. The cubicle should be approximately 1200 mm square, without a curb at the entrance, and with a 800 mm grab bar both sides. Controls should be placed outside of the shower area and should automatically maintain water temperature. A low pressure telephone type hand shower spray should be provided. There shall be working space on one side of the shower stall, which shall be separated from the shower by a half wall. Consider providing more than one type of tub in the fixtures that serve the facility overall. Commentary: The recommended combination of one assisted bathing tub and one wheelchair accessible shower provides some flexibility for meeting individual preferences. Provide space for residents to dry and comb their hair. Consider the provision a vanity, washbasin, and mirror. A non-scald mixing valve of the pressure-activated type shall be incorporated in both shower and bath facilities. Consider providing a wheelchair accessible toilet complete with grab bars screened from bathing area or in a separate adjacent room for wheelchair accessible shower or assisted bathing tub plus washbasin and toilet. Provide a ceiling heat radiation device over the resident drying space and consider additional ways of helping a resident to feel warm in the bathing area. Curtains that pull around the tub can be used to control drafts and increase the feeling of privacy appropriate to this intimate activity. Towel warming cabinets can be used to warm towels for the end of the bath. Curtain materials and towel cabinets should be selected to give a home-like rather than an institutional appearance. Commentary: The Working Committee members noted that both a toilet and a basin are useful adjacent to a bathing area although some care providers delete the toilet. The Working Committee noted that the toilet and basin could be provided in an alcove of the bathing area. The care providers interviewed preferred walls for privacy. The hand basin is also useful for staff to wash their hands. The hand basin could be located in a wheelchair-accessible vanity counter for resident grooming in the bathing area. We note that Dr. Tooth believes that grooming activities are the primary way of helping residents to maintain their self-esteem in a care facility. 3.7.9 Space allowance for wheelchair shower or assisted tub and toilet plus wash, handbasin is 10 sq.m. 4.1.1 The Care Centre will be the main location within the facility for staff to carry out residents health care planning and monitor building security and nurse call systems. 4.1.2 A Care Station will occupy a central location within a care unit or care group which will provide space for staff to carry out administrative duties in private yet still remain in close observational contact with residents. 4.1.3 Figure 4-1 shows potential relationships between a care station and care centre. The facility layouts which incorporate these relationships will vary depending on the particular care providers, resident groups and site conditions involved. 4.1.4 The functions assigned to care stations, medications rooms and other care support areas serving the care unit(s) must be coordinated with the functions assigned to the care centre and other central support areas serving the entire facility. 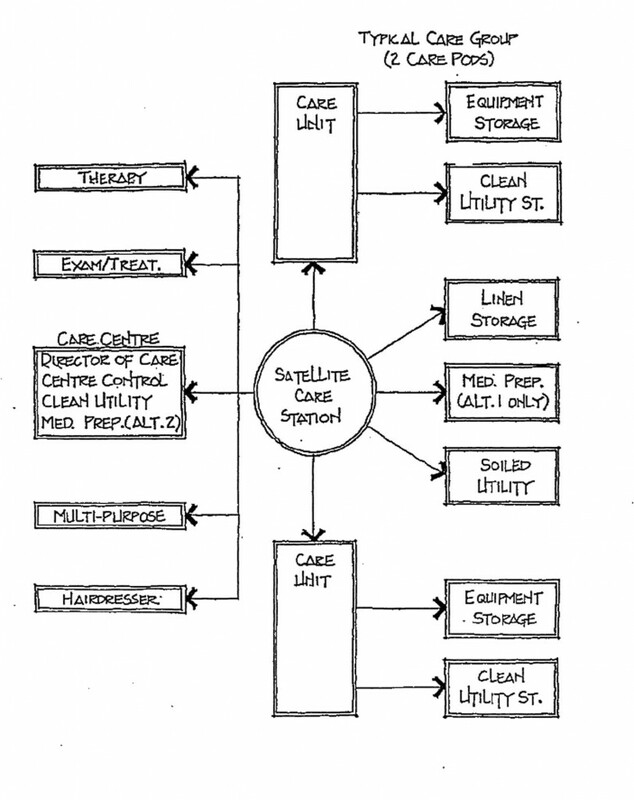 The determination of the need for central support and/or satellite areas for particular functions and whether the care station serves one or more care units should be based on the number of beds in the unit, the types of residents and the levels of care required. Supply and distribution systems also need to be considered. 4.1.5 The key concern for care providers, consultants and Ministry representatives alike should be to define the functions of each support area carefully. This makes it possible for all parties to ensure that each needed function is covered and that duplicated functions are avoided except where justified. 4.2.1 The Care Centre should be located as centrally as possible in the facility. It is desirable that the care centre command the best view possible of the facility corridor(s) and the entrance(s) to the facility. (Direct views can be supplemented where necessary by remote cameras or sensors that monitor activity in the corridors of the care units and in the main corridors of the care facility.) Close proximity of the care centre to the entrance(s) is an advantage as it facilitates observation and direction of persons entering or leaving the facility by the staff. The Care Centre may also be used for night reception and security control. frequent interaction with the Administrator. 4.2.3 Considerable variation in the arrangement of spaces and the nature of the main work area is possible. 4.2.4 Space allowance 20.0 sq.m. 4.3.1 A Care Station Space may be defined as an enclosed office, “reception” type counter facing the residents or simply a desk located in a quiet space away from resident activity. 4.3.2 The Care Station if provided in the form of an office will be an enclosed workroom containing two work areas: a desk for the supervising nurse and a staff desk (with computer) for charting and care planning along with the necessary file storage and bookcase for references. Two to three people will also meet here to discuss a resident’s care plan. A window(s) looking into the common area of the care unit(s) and exterior walking areas is desirable to maintain visual contact with residents. Commentary: A nurse and a care aide or activities aide can work together more effectively to solve problems if some key staff communication on unit can take place in private without the distraction of residents who keep repeating questions (Where am I? Are you my daughter?) and touching the staff for reassurance. Unless there is a chance for a moment or two of relief for staff when needed during a shift, over time it is hard to keep communicating effectively with residents who need a friendly reassuring answer every time they ask the same question and get upset if they are ignored. This space can also be used when a staff member needs to make a quiet phone call to a resident’s family or meet with a physician or other visiting professional needing to discuss an adjustment in a resident’s care plan. The care office workroom is intended for use by 1-3 staff while they are on duty. The larger Multi-Purpose Training and Activity Room which serves the entire care facility can be used for more formal meetings when coverage of the unit can be pre-arranged. The central staff lounge is a separate area used by care staff when they are off-unit during their breaks. One possible layout for a satellite care office is shown in Fig. 4-2. Since staff want to be alerted to any change on unit, a window looking from the care office onto the common areas of the care units is desirable. A view of the external walking loop would also be desirable if the care office location makes this possible. The window from the care office onto the care units serves two purposes. When the nurse supervisor needs to be at her desk, the window allows her to see what is happening between residents and between staff and tell when help is necessary. The window also lets residents see where the nurse or staff have gone which is reassuring. 4.3.3 This Care Office could also provide secure storage for one medications cart if required (see Medications Alternative 2 below). 4.3.4 If an additional control point for each care unit is needed, a simple desk or table for staff can be integrated into a common area. The care desk should be located to supplement the coverage provided by the Care Office particularly if serving two or more care units. For example, a care desk could be located to control the entry to each care unit if the Care Office were located elsewhere. The care desk should be visible (directly or by camera) from the Care Office. The desk height should allow for level eye contact with a resident in a wheelchair. Commentary: Margaret Calkins1 describes the two philosophies for providing a care station as the traditional medical model of “a reasonably large, clearly visible station” and an alternate approach of ‘reducing the size and scale of the ‘station drastically, until it is little more than a desk.” The second approach which she proposes as a way to support the primary concern of “increasing the intrapersonal contact between staff and residents,” is also recommended in the Health and Welfare Canada guide for dementia design 2. A residential type of desk or low work table you might choose for your own family room may be the right compromise. This kind of desk takes up little room but can still serve as a central point where a visitor or resident can go to look for information from the staff. A desk which takes little room leaves more space for residents clustering to watch people coming in and out. This clustering of residents often occurs around the elevators on a care floor (as well as around the main entry for the facility). In the Phase 1 interviews for this review project, care staff in three recently designed care facilities reported that the formal nursing stations in the dementia care units were largely unused. Staff were out on the floor interacting with residents most of the time. When they did have desk work, they found that tasks needing concentration could not be done at the open care station because of constant interruptions from residents seeking reassurance. For this reason large formal nursing stations are not recommended. If a control point in addition to the Care Office is needed, a simple table or desk should be provided in the common area of each care unit. 4.3.5 The location for the Care Station should be carefully selected for the best views of the resident common areas indoors and out. Cameras can be used to monitor activity in hidden parts of the corridors. For night use motion or other sensors can be used in the resident rooms in addition to the nurse call system. These types of remote systems (which can be monitored at night from the Care Centre as well) are one of the ways of assisting a few staff to cover a large facility. 3 Dr. J.S.H. Tooth, Dementia Care, A One Day Workshop for Professional Caregivers, Oak Bay Kiwanis Pavilion, Victoria, September 1994. 4.3.6 In a multi-floor facility, control of access to each floor needs to be considered either through the Care Centre, Care Office or Care Desk. 4.3.7 Space allowance 17.5 sq.m. Adjacent to, and easily accessible from the Care Station (Alternate 1) or the Care Centre for the entire facility (Alternate 2), provide a medications room fitted with counter space that includes a sink with a gooseneck faucet and storage cupboards. Depending upon the nursing procedure for medication administration the room will be required to accommodate one to three medication carts approximately 700 mm x 500 mm x 1000 mm high. The medications carts are not to obstruct the work areas in the room. As the monitored dosage system requires storage for residents medication cards, storage cupboards or wall racks must be provided. A lockable and alarmed medicine storage cabinet shall include a separate locked compartment for narcotics, controlled drugs and liquor designed to meet the requirements of the College of Pharmacists of B.C. “Recommendations for Drug Storage cabinets”. Space shall be provided for a small refrigerator for biologicals. Provide a satellite medication room adjacent to the Care Stations. The satellite medication room would include space for storage of a medications cart and.the full required medications support for the care unit or group. The space allowance is 7.5 sq.m. No central medication room would be required next to the Care Centre. Commentary: A Working Committee Meeting, it was agreed that with the care unit design, full medications rooms serving each care group of two care units would provide the most effective use of staff time. However it was noted that there are care providers who are designing care unit concepts today who plan to use only one central medications room and to include secure storage for the medications carts in the care office serving the care units. It was agreed that the guidelines needed to show the two alternative approaches. The advantages of having the full Satellite Medications Room adjacent to the two care units it serves is the effective use of nursing staff time. The RN or LPN giving medications must prepare the medications cart, make the medications pass and put medications away. This is a time consuming task which occurs at least four times a day and as often as two hours in some cases. If the nurse has to go each time to a central medications room distant from the care group it would be less effective. There is a limit to the number of beds for which a nurse can effectively and safely issue medications. The prototype Care Group of 36 beds (2 care units @ 18 beds) is a reasonable number. An advantage of the Satellite Medications Room for each Care Group is that it avoids all the nurses for all the Care Groups descending on the Central Medications Room to prepare for a medications pass at the same time. Preparing for a medications pass is a complex task which takes concentration and quiet. Each separate medication for a resident is issued in a separate blister pack. If the medication is ordered to be given four times a day for a month, there are four blister packs, one for each time of issues, with one pill per blister for a total of 30 days. Many residents have at least six medications. The nurse giving the medications must check the medications administration sheet for every resident and make sure all the blister packs for all the residents are on the cart. She must also prepare for all the ways residents want to have their medications (with orange juice, or ground up, etc.) before she can make the medications pass. The nurse is also dealing with changes in physician’s orders which occur frequently. A nurse dealing with 36 beds could get up to ten new orders a day. If each one is a medication given four times a day, there are 40 blister packs to receive, record and store. At the regular changeover (every 35 days in some facilities) the nurse must check 35 days of up to ten medications given up to four times a day for all the residents for whose medications that nurse is responsible. This complex task of assembling all these medications takes concentration in a quiet place without interruptions since mistakes cannot be tolerated. This is one of the reasons a enclosed medications room is needed rather than just a locked medications cart. Medical supplies normally should be stored outside the medications room since these supplies can be issued by care aides unlike the medications which can be issued only by an RN or LPN. Security for the medication room would be the responsibility of the nurse supervisor for one Care Group. Provide a central medication room serving the entire facility adjacent to the Care Centre. The space allowance is 11.0 sq.m. The Care Station serving each care unit or group would include secure storage for the medications cart. Commentary: One Central Medications Room adjacent to the Care Centre may be satisfactory when a facility has very direct circulation between the Care Groups and the Care Centre serving the entire facility. When a care facility has more than one storey, there may need to be at least one Medications Room per floor to make effective use of staff time. Commentary – Effective Use of Direct Care Staff Time: The Medications concept for a particular facility should ensure effective use of staff time in the safe delivery of medications and provide security for medications storage. In care unit layouts, some duplication of space for satellite medications rooms will be justified if it makes use of staff time more effective. Provide a cupboard or cart storage space for medical and surgical supplies, dressings, sterile trays, incontinency supplies, etc. on every care unit at a central location easily accessible from the resident rooms and the Care Station. Commentary: In a cart system, each care aide has a clean supply cart which is stocked from the central clean supply room. Each clean supply cart normally serves 8 to 9 beds. The clean supply cart is stored on unit during the shift. At the end of shift the care aide restocks the cart from the central clean supply room for the next shift. Provide one central clean utility room to stock medical and surgical supplies, dressings, sterile trays, incontinency supplies, etc. for the entire care facility. This room should be centrally located and adjacent to the Care Centre for the overall facility. Space allowance is 11.0 m 2 . Commentary: Care staff go to the Clean Utility Room for medical supplies less frequently than nurses go to the Medications Room. With cart (or cupboard) storage of medical supplies on each care unit, one central Clean Utilities Room can serve the entire facility. cupboards over, and space under for mobile cart, trash container, etc. Counter sink with elbow operated controls, gooseneck faucet, soap or detergent dispenser, paper towel dispenser, and waste container. Small surgical lamp which may be pedestal type. Wall mounted clock with second hand. – Movable non-hydraulic dental chair. – Generator for portable suction equipment and a pressure operated hand drill. 4.6.3 Consideration should be given to identifying space for specific portable testing services where changing technology makes it more effective to bring the service to the residents rather than the resident to the service. These types of portable testing services could be accommodated temporarily in the examination/treatment room. 4.6.4 Space allowance 18.0 sq.m. Commentary: There will be no major surgical, clinical, laboratory, or radiology services provided in the examination/treatment room. Residents who require these types of services should be transferred to or receive them as outpatients at an acute care general hospital. 4.7.1 Provide an occupational/physiotherapy area located adjacent to the Resident Activity Area in each Care Group. – Counter sink, gooseneck faucet, soap or detergent dispenser, paper towel dispenser and waste container. – Work counter approximately 600 x 1500 mm long with storage cupboards under and shelves over. Commentary: The need for space for physiotherapy treatment and storage of a physiotherapy table was emphasized by the Working Committee. The space should be provided as a separate room or private alcove off the activity room. The description of the room and the space allowance comes from the current guidelines. 4.8.1 Each Care Unit will be served by a linen alcove or cupboard where a linen cart or carts can be stored with shelf space for extra pillows and blankets over. 4.8.2 The space allowance is 2.5 sq.m per cart. 4.9.1 Provide a soiled utility room for each Care Unit or Group which functions as a holding area for soiled linen, used equipment, trash and waste. The soiled utility room will include an area to wash off soiled sheets and storage for soiled linens. – Counter top with counter sink (single compartment), elbow controlled mixing faucet, paper towel cabinet and soap dispenser. – Shelves under and over counter. – Wall hung bedpan flusher-sanitizer. – Garbage container (or cart). – In addition to the above, one room shall contain a utensil washer-sanitizer. 4.9.4 Space allowance 11.0 sq.m. 4.10.1 Provide one Care Equipment Storage Room for each Care Group. This room is intended for ready storage of care equipment which is needed for daily use in the care units as opposed to the longer-term bulk storage room provided for the entire care facility. 4.10.2 Space allowance 20 sq.m. For details of equipment storage and other associated storage see Commentary. Portable lifts will continue to require storage on care units in the foreseeable future. Ceiling tracks for lift attachments are expensive and institutional in appearance. Ceiling lift tracks therefore are likely to be the exception rather than the norm. The number of commode chairs in this list of storage for 36 beds is lower than in older extended care hospitals. All resident rooms in an MLC facility have ensuite toilets and almost all resident rooms are single occupancy. The storage space allowance assumes that standard collapsible wheelchairs or other wheelchairs assigned to residents would be stored in the resident rooms, as would the geriatric recliner chairs in use in the residents rooms or dining or lounge areas. A few spare wheelchairs or geriatric chairs for ready use would be kept in the Care Group storage with more spares in the bulk storage for the facility. For efficient space use, storage methods need to be organized and convenient. Hanging methods for light articles should be considered to use more of the available height in the storage room. Many existing storage rooms seen in Phase 1 had the access into the room blocked by parked walkers or wheelchairs. Adequate storage for care equipment is a basic requirement for flexible use of the care unit. The Delta View Habilitation Centre has two 40-bed care units, both initially designed for dementia care. One 40-bed care unit is now being used for extended care while the second care unit (40 beds in two 20-bed clusters) serves the intended use of dementia care. The care provider reported that the care unit design was serving extended care relatively well. However many pieces of extended care support equipment (lifts, walking supports) were taking up part of the interior walking loop which could be a concern for fire safety. The need for significant extended care storage was also noted of the Fairfield Unit at Glengarry Hospital (Juan de Fuca Hospital Society) which includes a conversion for dementia care. It was noted that lifts and other equipment were disturbing to residents and should be stored out of sight if possible. Where storage is not available, equipment ends up in hallways which is a fire safety concern or ends up in bathing areas which increases the fear some residents have of the bathing area. Storage will also be usefully located adjacent to Activity areas for items not in everyday use. The care unit will contain the primary resident activities areas (lounges, activities, dining and resident kitchen areas) and will provide direct access to suitable outdoor areas. To provide effective staffing and/or more flexibility, these areas can be located adjacent to or combined with the same areas in the adjoining care unit. and the areas must therefore be located so that they are easily accessible. Consider locating a washroom close to the dining area if the dining area is distant from resident rooms. Some resident common areas will serve the entire care facility (examples: multipurpose activity, hairdressing salon, etc.). Consider locating these particular common areas in conjunction with physiotherapy and examination rooms on a “main street” giving residents somewhere to go for an outing outside their care unit but still inside the care facility. Other “main street” features may include a banking counter, tuck shop, and retail crafts displays. The “main street” concept for outings inside the care facility can be an important supplement to actual outings away from the care facility which tend to be somewhat limited due to expense and the cognitive and/or physical impairments of the residents. Fig. 5-1 shows the potential relationships between the resident common areas in the care units and those in the overall facility. Commentary: Group activities have several therapeutic functions. Participation in the activities of daily life (eating, talking, grooming, exercise, crafts, etc.) in the common areas encourage residents to meet some of their social needs interacting with other residents and staff. These activities also stimulate residents to maintain their mental and physical dexterity and maintain and sometimes improve their physical and emotional wellbeing. 5.2.1 The resident lounges are intended to be small spaces within the care unit. Consider dividing this space into one quiet sitting area (for visiting with family, reading, sitting) and a separate space for louder uses like television-watching. Area should be located to provide views of both inside and outside activities. 5.2.2 Encourage the formation of smaller social groups within the care unit by associating each small lounge with a cluster of resident rooms. 5.2.3 Space allowance 1.4 sq.m resident. There is a need for both small and large activities areas in a care facility. The small activities area in or adjacent to the care unit is the primary space for daily use. To supplement the care unit areas, some facility common areas can also be provided for residents. 5.3.2.1 Some flexibility is needed to allow the area to serve both sedentary activities like crafts and puzzles (generally long term) and physical activities (generally short term) which take more space. Consider locating the activities areas for two adjacent care units next to each other and providing a movable wall between the two rooms. The rooms would normally be used separately by small groups but could be combined for larger activities when needed. Sound control between the two rooms must be considered. 5.3.2.2 Space allowance 1.4 sq.m resident. 5.3.3.1 It is desirable, budget and space permitting, to provide a large activity and training room to serve the entire care facility. The space could be used for larger-scale resident activities that cannot be accommodated within the care unit, staff in-service training and team conferences, religious events, and family and community education meetings. The multi-purpose room should have a central location with easy access from the main building. Where appropriate this multi-purpose activity room could also be offered or rented out for community events. Commentary: Multi-purpose use is likely to be the only way to justify a space allowance to support the valid requirements for in-service training, community outreach, and large resident activities. Budget constraints will almost certainly prevent separate space being provided for each requirement. Commentary: In-service training is needed on a continuing basis in multilevel care facilities due to the increasing sophistication of medical care and the changing techniques for “gentle care” for clients with moderate to severe dementia and/or behaviour dysfunctions. While direct care staff may express the greatest need for in-service training programs, it can also be helpful to have food services, housekeeping and other staff participate in gentle care conferences. Many of these staff members have daily interactions with residents that can also fill important social and therapeutic needs for residents. The need for in-service training for multilevel care staff may increase in the future as cost control measures in the acute care system and downsizing of mental health facilities bring an even greater diversity of clients into facility care. Informal team conferences for two to three people can take place on-unit in the Care Office. While the small group activities areas in the care units are the .primary spaces for daily use, operational budgets and volunteer shortages will always require some larger group activities for musical evenings and other special events that brighten the lives of residents. Residents are often encouraged to invite family members to attend these events with them. Locating these larger special events in the Multi-Purpose Room will also give frail residents the opportunity for a special outing into the main facility. These kinds of larger-scale activities include –choirs, skits,. singalongs, religious and memorial services. 5.3.3.2 Space requirements for this multi-purpose room will vary depending on the projected number of residents in the particular care population able to use the room. To check adequacy of the proposed space when used for staff training, divide the proposed net area by 1.0 sq.m to determine the number of staff who could be accommodated. Commentary: Of the 45% 1C3 clients in the future care population, the majority are projected to be moderately to severely cognitively impaired clients who would not attend larger events normally. The 1C3 client population may also include some cognitively intact clients who could attend these events. Of the remaining residents who are cognitively intact enough to attend larger events, some 80% can be expected to participate. These residents would include the 10% IC2 and an estimated 50% of the EC residents who make up 45% of the future care population. This equates to 26% of the total residents. Provide space for 25% of the total residents in the facility is therefore suggested. In a 110 bed care facility, this would provide space for 28 residents during activities or for at least 39 staff members during in-service training. This should be ample provision for numbers of staff. Space Allowance 1.4 sq.m x 25% of total residents in a care facility. 5.4.1 Provide dining areas for each Care Unit or Group. Provide flexible ways of creating smaller dining groups that is feasible with available staffing and by screening the eating assistance areas from other diners. The provision of permanent walls is preferred over the use of free standing dividers for stability. Although this may limit, flexibility necessary. Commentary: Smaller dining groups reduce the distractions that interfere with people eating and socializing. Flexible dividers are needed to screen people needing eating assistance because the number of residents needing help varies from meal to meal. In the Phase 1 analysis, the Review Committee reached consensus that a dining room for two groups of 12 residents would require more staffing than one dining room for 24 residents. The conclusion was that, with current MLC staffing allowances, dining rooms should serve a minimum of 24 residents divided into small groups. Flexible ways of creating small dining groups are essential because of the practical problems of accommodating a varying number of diners using chairs, large geriatric recliner chairs and wheelchairs. Flexible dividers are also needed because of varying numbers of residents needing eating assistance and the types of tables this assistance sometimes requires (special feeder tables, etc.). Two care aides can provide this eating assistance while being ready to resolve problems that may occur in the rest of the dining room where residents are eating independently. Flexible ways of dividing dining groups are also required because of the varying need to separate some clients due to behaviour problems. Where unique circumstances apply and staffing feasibility has been negotiated with the Ministry, care providers can apply to the Ministry for approval of smaller dining areas (one per unit for example). Mealtimes and the need for eating assistance are key factors in the direct care workload. More residents need eating assistance now with increasing care levels. Feasibility of staffing for the size of dining area proposed must be ensured to keep staffing costs reasonable as staffing represents at least 80% of the operating costs in an average care facility. 5.4.2 The dining area needs to have sufficient room for residents, their walkers, wheelchairs, portable oxygen carts and staff providing assistance with eating. The proposed space allowance below is for dining only. Provide a separate space for a servery and resident kitchen. Commentary: There is consensus that the current allowance of 2 sq.m per resident needs to be increased. Fig.5-2 shows that 3.0 sq.m per person would allow space for the turning movements of conventional wheelchairs for every resident. Fig.5-2 also indicates that geriatric recliner chairs could be substituted for wheelchairs at some locations. This is a significant increase over the current MLCDG allowance of 2 sq.m per resident where servery space was expected to come out of the total allowance. However the 3.0 sq.m allowance would still require careful planning of the dining area layout. 5.4.3 Control of noise is essential so that elderly residents with some hearing loss are not hampered by room noise from socializing with others at their table. The need for noise control throughout the care unit was emphasized in the planning interviews. Control of noise in the dining area is particularly important because meals are the primary opportunity for social contact for many of these residents. This includes interactions between staff and residents as well as interactions among residents. One care provider noted that, “we always try to get one of the food staff in the servery because the residents like them so much”. Reducing the size of dining areas is the first way of reducing noise and other excessive stimuli which impact residents. The smaller dining areas in the care units will still require sound absorbing surfaces to control servery and other noise. Intercom announcements should also be avoided where possible. 1 Calkins, Margaret, Design for Dementia, 1988. 5.4.4 Consider providing a washroom adjacent to the dining area. Commentary: It has been suggested that in a care unit design where the dining area is a short distance from the resident rooms, it should be possible for the elderly to go to the ensuite washrooms at meals. However the care staff in two recent care unit designs reported that a toilet opposite the dining area is essential. the ensuite toilets. The toilet was added after the facility was in operation for two years. Toileting urgency is characteristic of increasing age. Providing toilets at key locations is a reasonable response that will reduce incontinency episodes allowing residents to maintain their dignity and independence while keeping staff workloads more manageable. 5.4.5 Space allowance 3.0 sq.m resident. 5.5.1 It is desirable that the care facility should have its own central kitchen. Commentary: When the food is good, mealtimes can be the highlights of the resident’s day. When the food is not pleasing to an individual, it is also the first item for complaint. Every care provider in the Phase 1 planning interviews emphasized the importance of a care facility having its own central kitchen because of the greater flexibility for responding to the individual needs of residents. It is essential that the care provider have some flexibility for responding to individual food preferences, diet requirements and differing eating dexterities of residents. Keeping each resident eating is vital because it maintains the energy residents need to participate in the daily life of their care unit. Adequate food intake also help stave off the weight loss that is a problem for many elderly, particularly in the later stages of dementia. Care facility residents vary widely in their abilities for eating due to the diverse client groups and the progressive nature of diseases like dementia. Clients in the later stages of Alzheimer’s Disease eventually lose the ability .to handle a knife and fork. Many will keep feeding themselves if meals are presented as finger food. Every resident who keeps feeding herself or himself helps keep the care workload manageable which is vital to keep operating costs reasonable. It is hard for care staff to plan ahead for the individual food needs of residents on any long term basis because the ability of a resident to eat “normal” food independently can vary from meal to meal as the client tires over the day or enters a period of ill health. Also the census of types of clients in the care facility varies unpredictably with death or acute illness of existing residents and the admission of new residents. Care providers reported that with a central kitchen on the premises, the facility has more flexibility in arranging foods that suit residents’ needs and preferences. Also food production staff in a kitchen on premises get to know individual preferences of residents and take extra effort to remember them. 2 Calkins, Margaret, Design for Dementia, 1988. 5.6.1 Provide a resident kitchen adjacent to the dining area. The space allowance is intended to provide a large family kitchen that would be used by residents between meals and at meal times would act as a servery and be used to accommodate the portable bulk food cart and other servery equipment needed for service of food prepared in the central kitchen. The food cart and other equipment would normally occupy the space only during dining food service. Commentary: Fig. 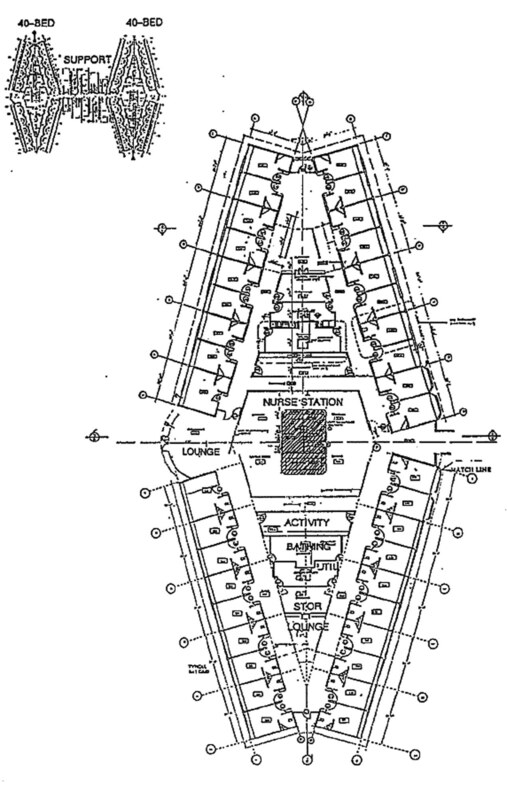 5-3 shows one of several layouts possible within the proposed space allowance. In the configuration shown, food would be served directly from the servery carts through the door or pass-through to the dining area. In an alternate configuration, food could be served from the carts to plates on the counter and then passed from the counter side through a door or pass-through to a dining area. These and other alternate layouts should be possible within this space allowance. When the bulk food cart is moved out to serve the next care groups on the floor, the space will return to its normal function as a resident kitchen. Fig. 5-4 shows that the space allowance provides enough room for 2-3 residents in wheelchairs to work in the kitchen once the bulk food cart and other servery equipment has been removed. Fig. 5-4 shows one dish cart still in place to collect resident dishes from snacks since dishes must usually be returned to the kitchen for washing to comply with health regulations. 5.6.2 The basic function of this space is as a resident kitchen that can be used by residents, who are not cognitively impaired, to cook, bake, make coffee and snacks for themselves. Cognitively impaired residents may also use this space for some kitchen activities with supervision from care staff. The kitchen will also function as an emergency night nourishment centre for the residents. All counters and appliances (ie. sink, oven, range top, etc.) must be accessible to residents in wheelchairs. 5.6.3 Safety is of paramount importance. A lock-out switch to control the on/off operation of the rangetop and oven should be provided in a location accessible to staff only. A lock may also be required on the refrigerator to control access for residents with eating disorders. 5.6.4 Between meals the room should have the familiar appearance of a large family kitchen. if a portable cart for cups and saucers is used between meals to dispense and collect cups for cleaning, consider ways of locating the cart (alcove etc.) to retain a residential appearance. When the servery equipment is in place for meal service the space must function to institutional standards and resident access controlled. Commentary: A portable cart for cups and saucers is often used so that dishes from resident cooking can be returned to the central kitchen for washing. However supplementary dishwashing will frequently occur within the resident kitchen as a therapeutic activity. 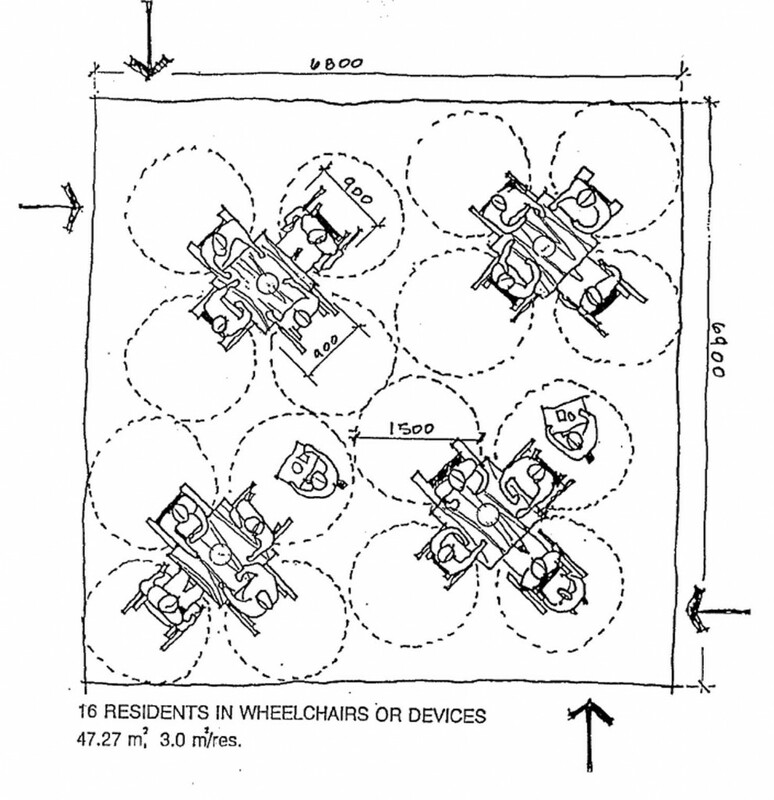 The layout should allow wheelchair turning radius between the counter and any proposed position for the portable dish cart (see Fig. 5-4). 5.6.6 The kitchen layout should be as familiar as, possible, consistent with its functions. Galley L-shaped and U-shaped layouts (with a stove-sink-refrigerator triangle) are more familiar kitchen layouts than extremely angular layouts. Commentary: Care staff have noted that while open hexagonal layouts for example are attractive but they can be confusing for the residents of the dementia care unit. 5.6.6 Consider the resident kitchen/servery as a separate room. Walls and a door (with access control) are an effective way to keep cognitively-impaired residents out of the resident kitchen until there is someone there to help with activities as needed. A separate room would also control servery noise during meals although sound-absorbing materials inside the resident kitchen should also be considered. Commentary: A door is a more effective way to control access than a low gate. Care providers have reported that gates controlling access to open kitchens are damaged by unruly clients and by wheelchairs. 5.6.7 Consider providing a large pass-through window which can be opened to give views of the resident kitchen when appropriate and hand out dishes or drinks. Provide a roll-down screen or other methods to control noise and/or close off views when needed. Commentary: Pass through windows are often seen as institutional and often do not provide adequate sound control. Sound absorbing materials used in the kitchen must be smooth and impervious to water if used at low level. 5.7.8 Counter cabinets and equipment should be designed and located for ease of use by residents as well as staff. Finishes should be easy to clean. – Work counters at heights suitable for resident and staff use. Provide open areas under sink, rangetop and work areas for wheelchair users. – A two compartment Sink 150 mm deep with a minimum of 650 mm clearance under, and 100 mm lever handle faucets. Insulate bowl and pipes to protect residents’ legs. – Storage cabinets: Below counter storage or separate wall-hung storage is preferred to above counter storage for ease and safety of use. Consider providing lazy-susan units to improve accessibility to any corner cabinets. – Rangetop, electric. Large front mounted controls with raised markings to aid residents with diminished vision. Range hood with domestic type exhaust fan connected to duct work required. Safety switch (staff operated) required. – Conventional Oven, self cleaning, electric. A side-hung oven door with glass panel with accessible controls. Safety switch (staff operated) required. – Microwave Oven, may be provided for resident snacks. The microwave could also be used for reheating food from the central kitchen, depending on the food delivery method used. The microwave is sometimes used in place of the conventional oven, although it does not provide the same capability for baking. Safety switch (staff operated) required. – Fridge, self-defrosting domestic type with separate opening compartments for fridge and freezer. – Dishwasher: if required to be under counter institutional type to comply with local health requirements for water temperature. 5.6.11 Space allowance 12.0 sq.m. Commentary: A new separate allowance for the resident kitchen and servery functions is recommended, as described above. This will help resolve the space shortages experienced under the current guidelines for activities areas and dining areas. Several also reported that the activities space allowance was very tight for clients with moderate to severe dementia and/or behaviour dysfunctions. Both these situations will be eased by providing a separate allowance for the resident kitchen. The resident kitchen and the servery both need to be located near an area with tables and chairs and floor surfaces suitable for dining. With the care units now proposed, it becomes reasonable to locate these functions in one space next to the dining area serving two adjacent care units. Providing one space allowance to act as the resident kitchen between meals and the servery during meals minimizes the overall space increase which is necessary. 5.7.1 Provide sufficient space inside the room for three or four residents to congregate while awaiting their appointments. A pleasant atmosphere should be created that encourages residents to take pride in their personal appearance. Suitable ventilation must be provided. 5.7.2 Provide space for a waiting area outside the room possibly in conjunction with the physiotherapy room. – Vanity unit with storage cupboards under. – Shampoo basin at height suitable for wheelchair access. 5.7.4 Provide space for the following furniture. 5.7.5 Space allowance: 10.0 sq.m. Commentary: Dr. Tooth3 noted that he considers grooming activities the most important therapeutic activity for demented residents because the residents maintain a sense of their own identity. 3 Dr. J.S.H. Tooth, Dementia Care, A One Day Workshop for Professional Caregivers, OakBay Kiwanis Pavilion, Victoria, September 1994.
care units can share an outdoor area when necessary due to site restrictions. Commentary: Ideally, each outdoor area should have the capacity to be segregated for use of the residents in one care unit. This allows residents to be separated into behaviourial or functional groups. However, site restrictions will frequently require two care units to share an outdoor area. It can sometimes be arranged that the two care units sharing the outdoor area house similar behaviour groups so that residents can use the outdoor space together. When this is not possible, times of use can be varied to achieve segregation. 5.8.2 The outdoor area should include a clear continuous walking loop designed to connect strategic areas of the garden so that residents have the sense of a meaningful journey and arrival at destinations. Landmarks should be developed to mark the different areas of the garden and help residents with wayfinding. The walking loop should have a hard surface that is suitable for use by residents with gait impairments and residents using walkers and canes, wheelchairs and scooters. The finish material should be low-glare, non-slip and avoid defects detrimental to movement of residents. 5.8.3 Locate the outdoor walking loop to provide reasonable observation from the common areas. The location of the outdoor area should not obstruct interesting views from the interior of the care unit and still maintain residents room privacy. Commentary: When resident safety on the outdoor walking loop can be checked easily, staff feel more secure allowing residents to use the outdoor areas unaccompanied. Free open access to a secure outdoor area is preferred for dementia care. Several examples of attractive outdoor areas that were rarely used because of this problem were observed during Phase 1. 5.8.4 The outdoor area should have the capability for exit control which is immediate and unobtrusive. To secure the area, suitable barriers which do not accommodate climbing to a height of at least 1800 mm are required to deter the more active residents. Consider 2400 mm barrier with back sloped top for outdoor areas above ground level. Commentary: Exit control to make the outdoor area secure will be needed when residents using the area are moderately to severely cognitively impaired and/or have dysfunctional behaviour. Best Practices: An Environmental-Behaviour Model for Alzheimer’s Special Care Units 4 analyses the issue of exit control and determines that the most effective exit control system is one which provides immediate control of exiting but is relatively unobtrusive. One example of an unobtrusive exit control system which is still immediate would be the fence surrounding the outdoor walking loop for the dementia care unit at the Westside Care Facility. The fencing consists of high transparent panels attached to steel posts painted blue. This well-detailed fence is an elegant and effective solution to exit control which still allows the dementia care residents to watch people coming and going at the main entry to the care facility. Some of the literature indicates that an unobtrusive fence which is concealed by landscaping can be more effective for dementia care because the cognitively impaired residents are not frustrated by the security system because they cannot see it. Views should still be maintained at some points through the landscaping to the surrounding area. Chain link fences have been used by some providers. Although the method of control is somewhat obtrusive, the residents can still see through the chain link fence to the surrounding views. The care provider using the chain link fence who was interviewed in Phase 1 reported that the reactions of residents were more positive than expected. Chain link fences are not recommended in the literature. Courtyards (either completely or partly surrounded by building walls) have also been used as outdoor walking areas for dementia residents. The Glacier View Special Care Unit in Comox designed by our firm features two outdoor areas for residents. One is a secure area of the landscaped grounds and the other is a courtyard completely surrounded by the SCU walls. The walking loop through the building connects the two outdoor areas. The care provider reports that the landscaped courtyard works well in many kinds of weather. A courtyard (either partly, or completely, surrounded by walls) allows the outdoors to be used for more of the year because the walls provide wind shelter and (properly oriented) collect and reflect winter sun. Some members of the MLC Review Committee do have a concern that dementia care residents will be frustrated by being in a outdoor courtyard completely surrounded by building walls. An effective compromise could be a courtyard which is surrounded by walls on three sides and has transparent safety barriers to control winds but allow views on the open side of the courtyard. Depending on the climate, methods for encouraging breezes to enter the courtyard in the hot summer periods may be required. 4 Zeizel, Hyde, Levkoff. Best Practices: An Environment-Behaviour Model (E-B) for Alzheimer Special Care Units, The American Journal of Alzheimer’s Care and Related Disorders and Research, March/April 1994. 5.8.5 Outdoor areas at ground level are most desirable. While the Ministry has a preference for care facilities on one floor, most urban sites require multi-story solutions. Where possible on sloping sites, grade access should be provided to more than one care floor. 5.8.6 Care units on floors without immediate grade access should provide access to an large outdoor balcony or deck with barriers that provide safety and wind protection without restricting views. Commentary: Trout Lake Manor, a 5 storey project on a tight urban site, provides an example of large balconies for resident use. High transparent safety barriers provide adequate safety while allowing residents to look out to the surrounding views of the park and nearby housing. Raised planters are being used by residents to grow beans and other vegetables. Safety glass or plexiglass barriers have the advantage of providing unobstructed views. The material used should be resistant to scratches and ultra-violet degradation. Heat build- up on the balcony during the summer needs to be considered, particularly in the B.C. interior. Adequate ventilation must be ensured. Metal grilles have been used in some other projects in the lower Mainland. The concern with metal grilles is that views must be maintained while keeping openings in the grille small enough that residents with dementia and/or behaviour dysfunctions cannot dangle their legs through the grille endangering their safety. One advantage of metal or wood grilles is the ventilation they provide to the balcony although wind shelter may be a concern. 5.8.7 The outdoor area should be designed to be usable for the maximum amount of the year. Shelter from rain prevailing, wind and sun must be provided in at least part of the outdoor area. In most parts of B.C. the effects of blowing snow will also have to be considered in the design of the outdoor area. Commentary: Several new MLC facilities in the Interior have outdoor walking areas but are not useable during the hot summer months due to lack of shade. Shade should be a consideration in outdoor areas for all zones of our province because the elderly have little toleration for extremes of temperature. Shading devices should be designed with seasonal sun angles to provide more sun in the colder periods of the year and more shade in the hotter periods of the year as appropriate for that location in the province. 5.8.8 Paving and wall materials selected for outdoor areas should avoid glare. Commentary: It is essential that paving materials and wall colours in outdoor areas have finishes and colours which avoid causing glare. Natural-coloured concrete walks and pavers cause glare in bright sunlight. The use of integral colour additives to the concrete and/or other non-glare materials should be considered. The visual impairments of most elderly makes it essential to avoid glare in finish materials inside and outside of the care facility. 5.8.9 Residents should have the opportunity to exercise, relax, practice gardening and interact with other residents, staff, family members or visitors in the outside activity area. Sheltered seating is needed to make this possible. 5.8.10 A wide mix of garden stimuli should be provided. Plant material should be selected to provide colour and fragrance for most of the year. Plants selected should be non-toxic because of the risk that some residents may unknowingly poison themselves. Raised planters or other methods of bringing the planting close to people in wheelchairs and allowing them to participate in gardening should be considered. 5.8.11 Space requirements for controlled garden environments will differ widely dependent on building configuration, site restrictions, and activity of residents. A minimum of 1.4 m2/resident of hard surfaced patio area is to be provided with seating for 25% of the residents it serves.